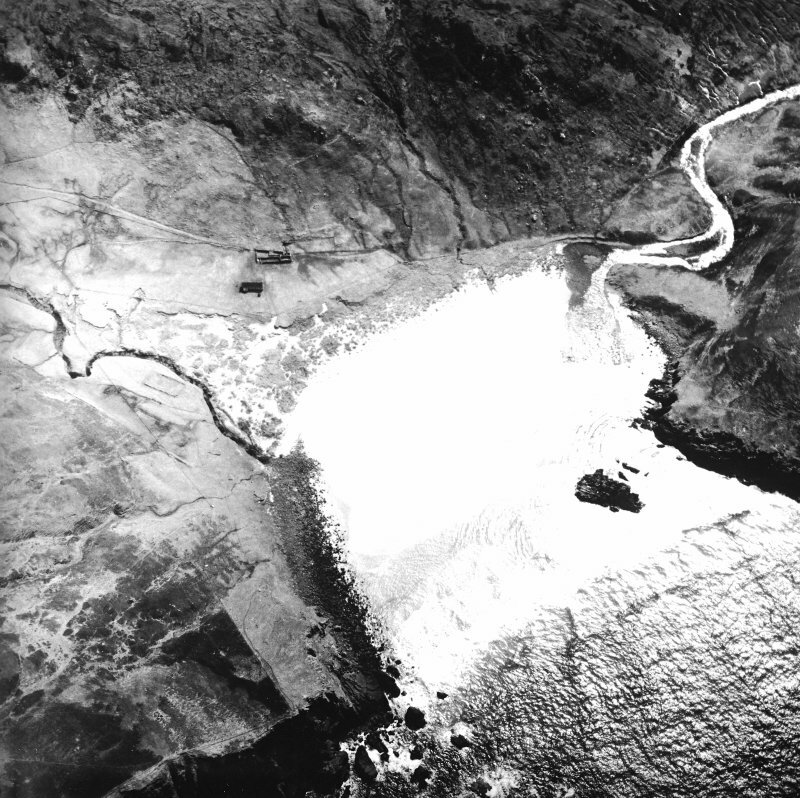 Oblique aerial view centred on the remains of the buildings, field banks and enclosures, taken from the NNW. Oblique aerial view centred on the remains of the buildings, field banks and enclosures, taken from the SW.
Oblique aerial view centred on the remains of the buildings, field banks and enclosures, taken from the ESE. Scan of an original pencil drawing of Kearvaig farmstead. 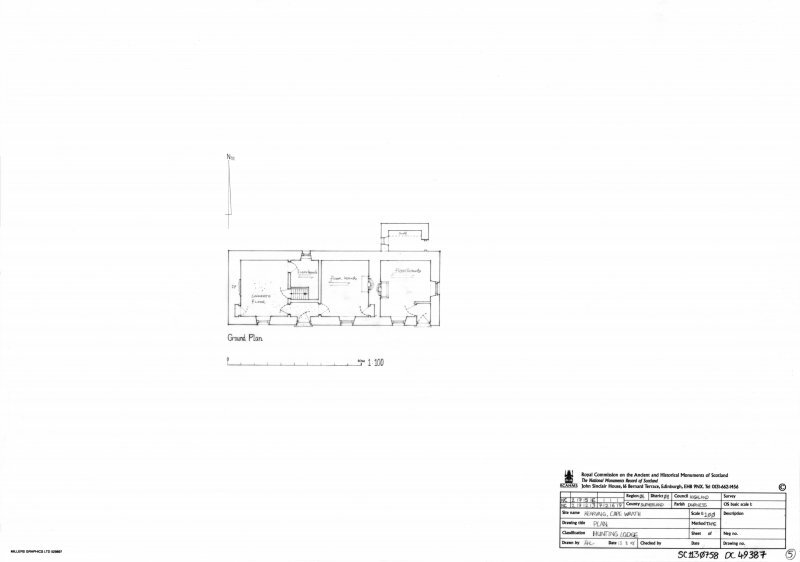 Original drawing was undertaken as part of the RCAHMS Cape Wrath Training Centre survey. 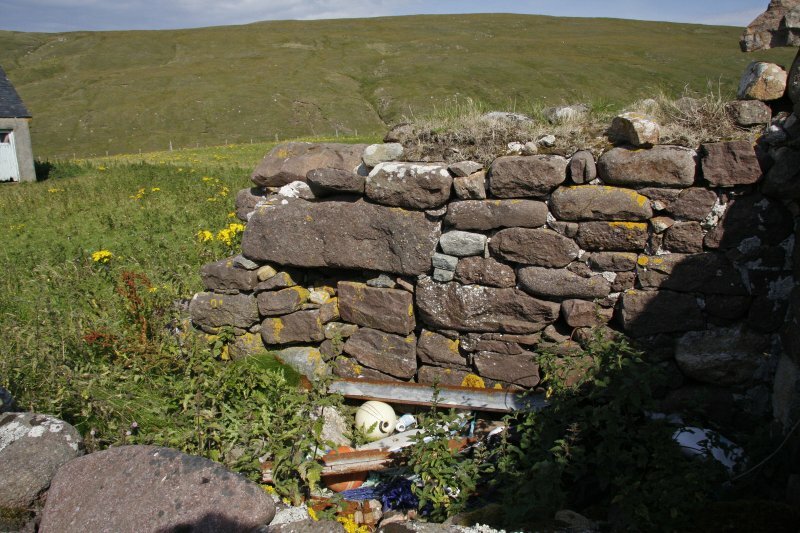 Kearvaig, shepherd's house, detail of skewputt at SE corner. 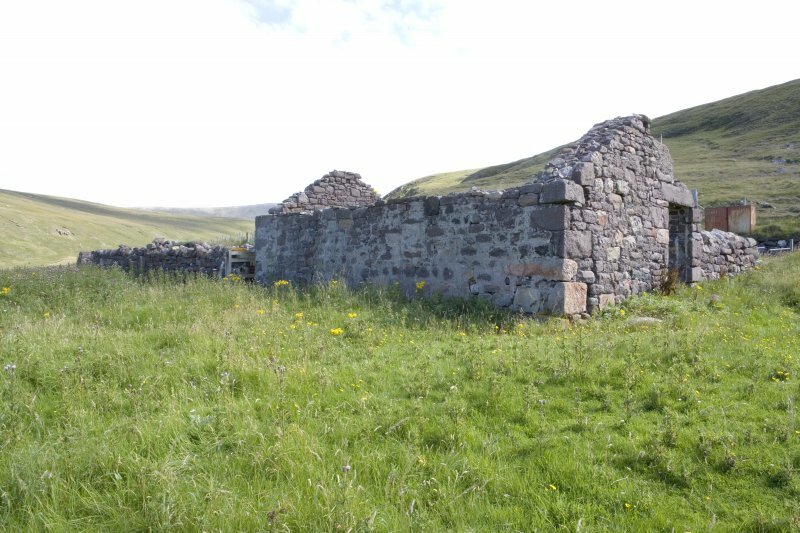 Kearvaig, shepherd's house, view from SE. 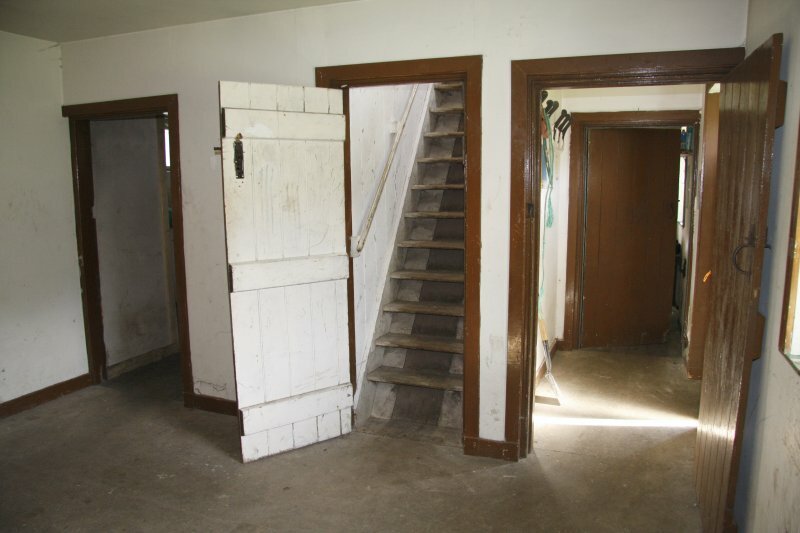 Kearvaig, shepherd's house, view from kitchen of entrance lobby and staircase. Kearvaig, farmhouse and range, detail of doorway in W end. 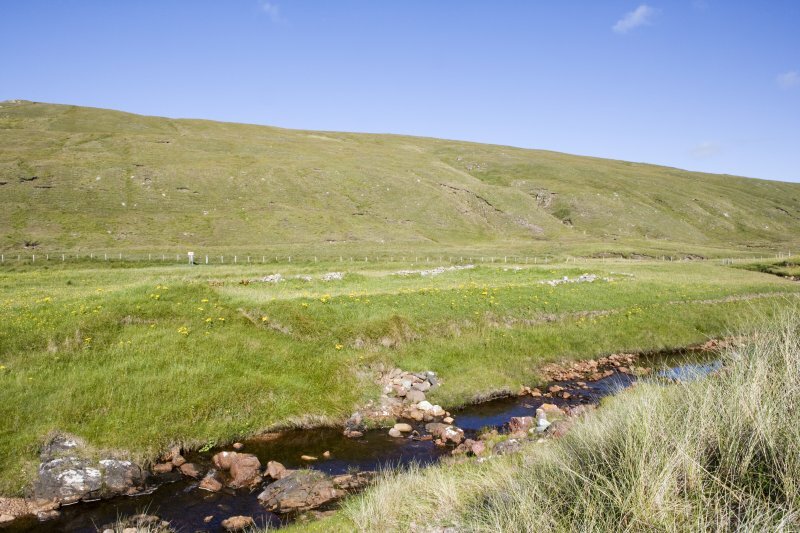 Kearvaig, farmhouse and range, view from N of W end of range. 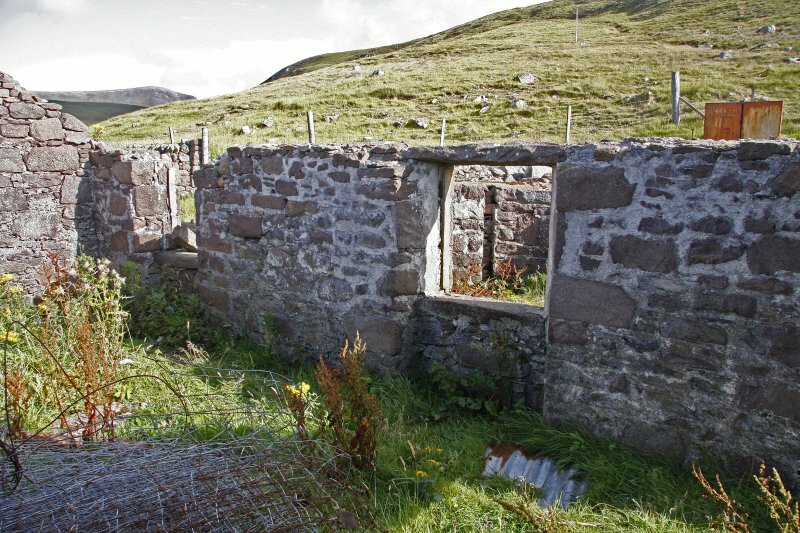 Kearvaig, farmhouse and range, view from SW.
Kearvaig, shepherd's house, interior view of E compartment. 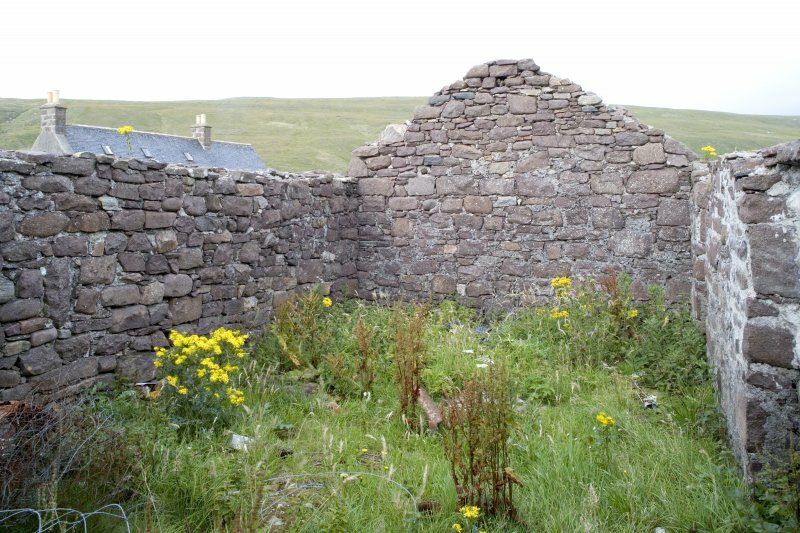 Kearvaig, shepherd's house, view of press and boarded-over wall. 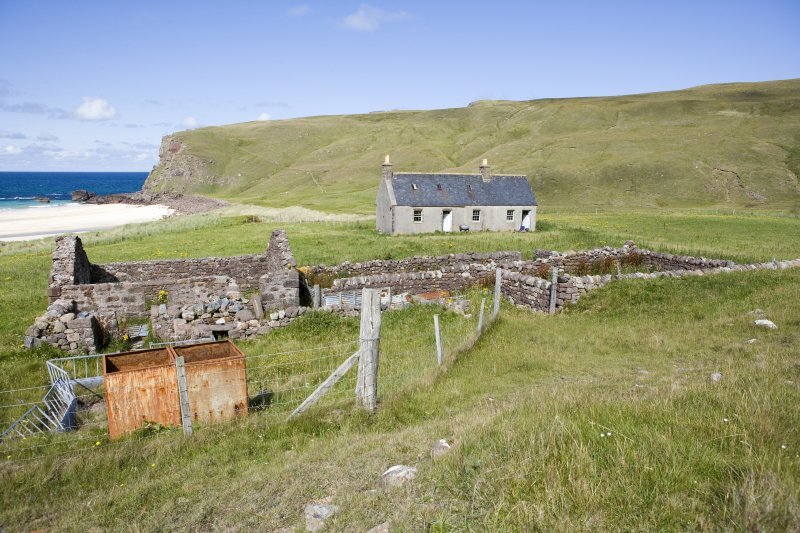 Kearvaig, farmstead, enclosure, view from S.
Kearvaig Farmsteading. 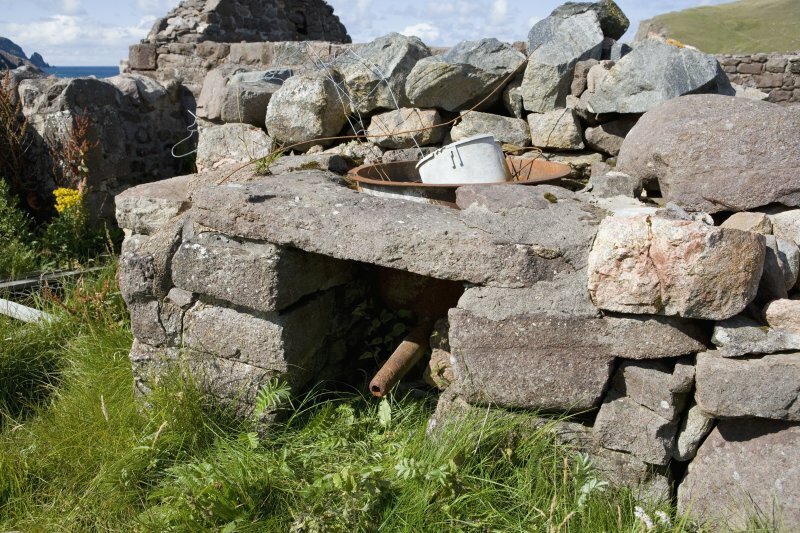 Detail of boiler adjacent to the sheep-dip on the S side of the range (CWTC08 273). 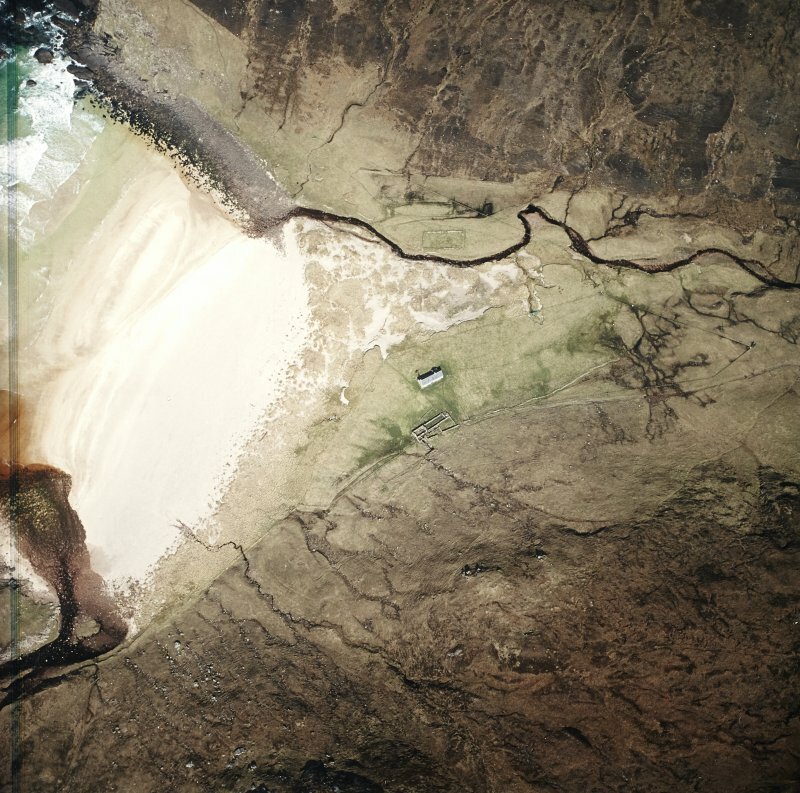 Kearvaig, farmstead, view of W end of range from E.
Kearvaig, farmstead, kiln barn, view from S.
Kearvaig, farmstead, kiln barn, view from E.
Kearvaig, shepherd's house, view from S.
Oblique aerial view centred on the remains of the buildings, field banks and enclosures, taken from the N.
Kearvaig Farmsteading. View from the NW of the interior face of the N side of the range. 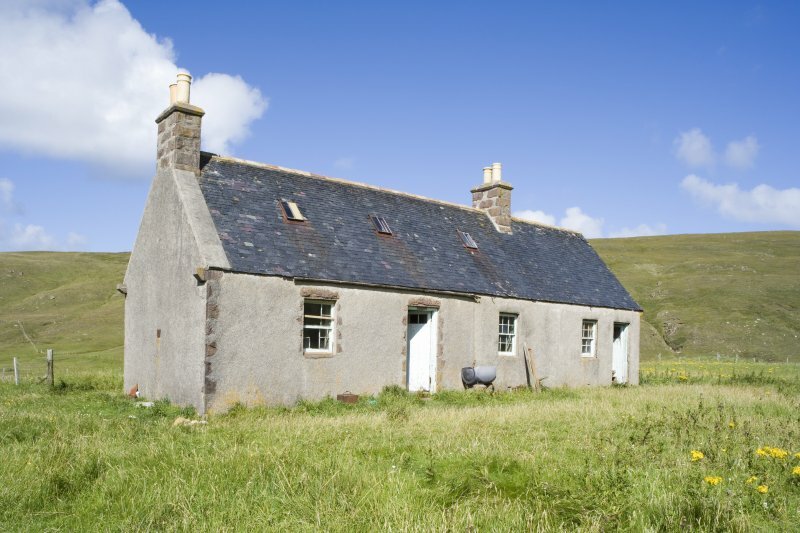 Kearvaig Farmsteading. View from E of a timber feature set into the internal face of the W gable wall of the range. 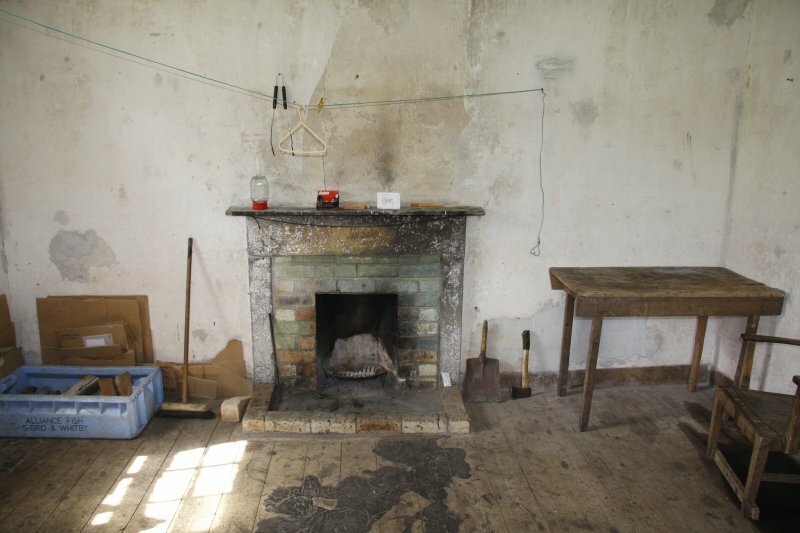 Kearvaig, shepherd's house, view of parlour fireplace and press. 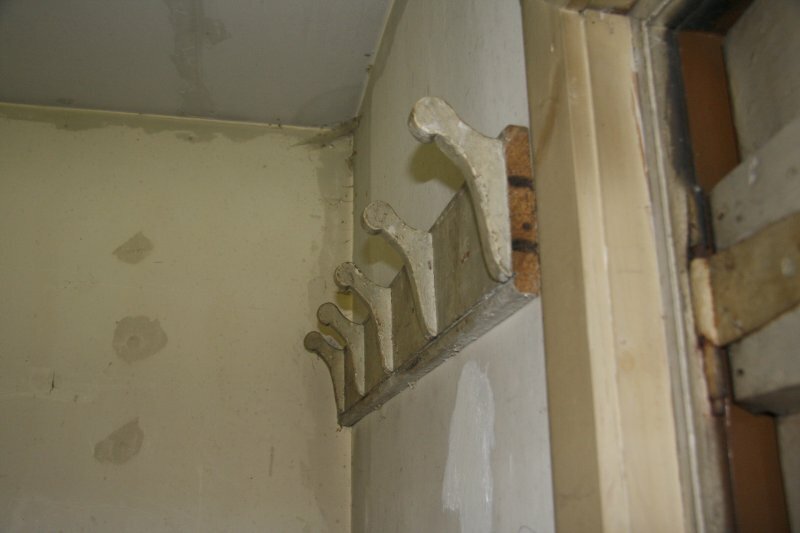 Kearvaig, shepherd's house, detail of wooden coat-pegs in back room. Kearvaig, farmstead and shepherd's house, general view from N.
Kearvaig, farmhouse and range, view of W end of interior from E.
Oblique aerial view centred on the remains of the buildings, field banks and enclosures, taken from the WNW. Oblique aerial view centred on the remains of the buildings, field banks and enclosures, taken from the W.
Kearvaig, shepherd's house, view from SSE. 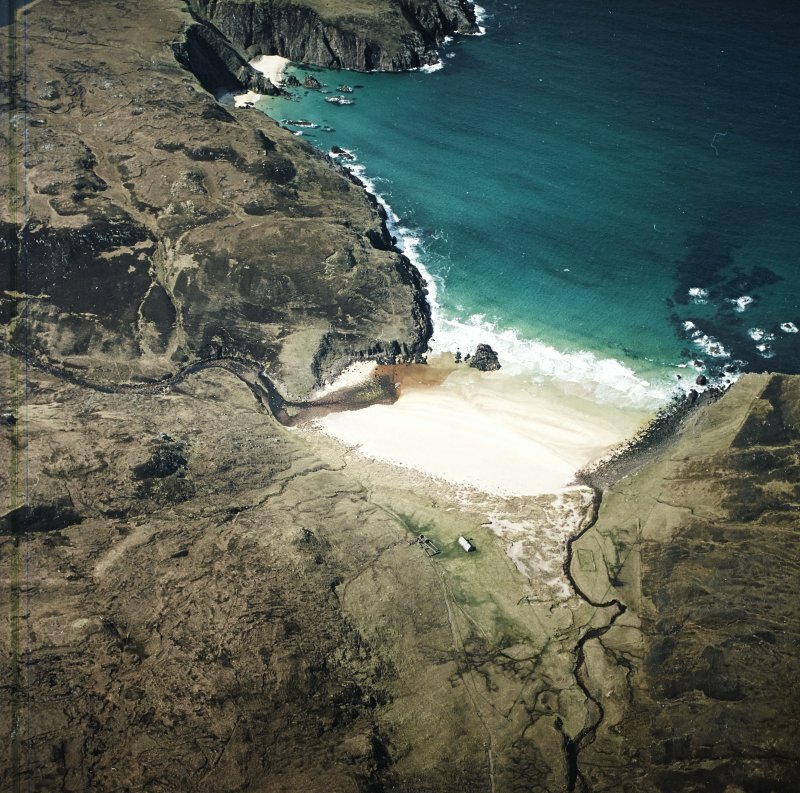 Kearvaig Bay, view from NW along river. Enclosure (399) on left terrace. 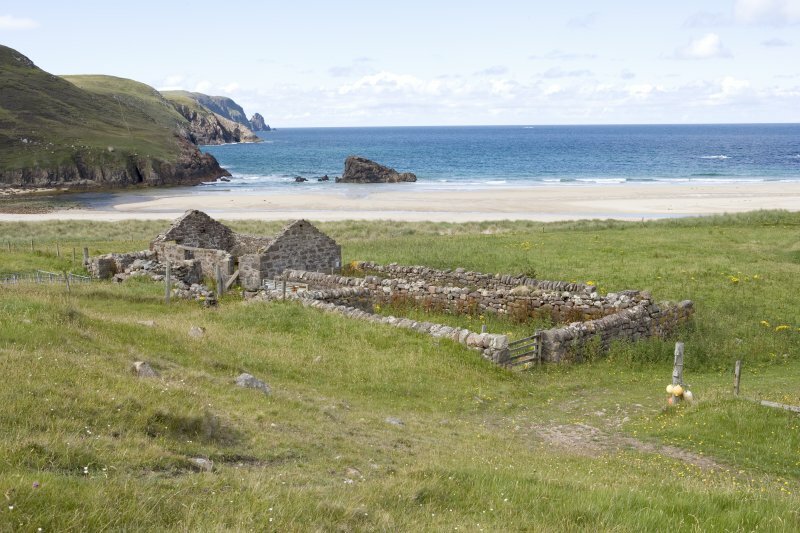 Kearvaig, farmstead, enclosure, view from SW.
Kearvaig, farmstead, view of west end of range from SW.
Kearvaig, farmstead, kiln barn, view from W.
Oblique aerial view centred on the remains of the buildings, field banks and enclosures at Keravig in Cape Wrath, Sutherland, taken from the ESE. 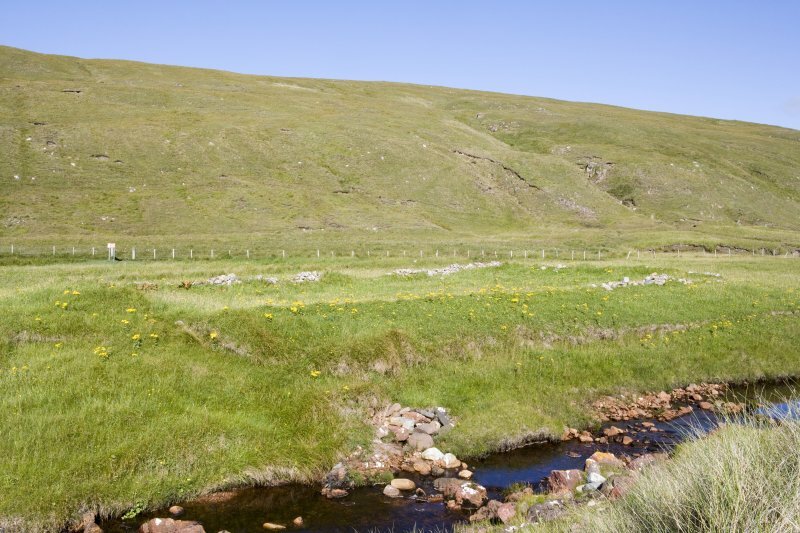 Kearvaig, farmstead, enclosure, view from W.
Kearvaig, farmstead, Mr I Parker (RCAHMS) surveying walling to S of range. 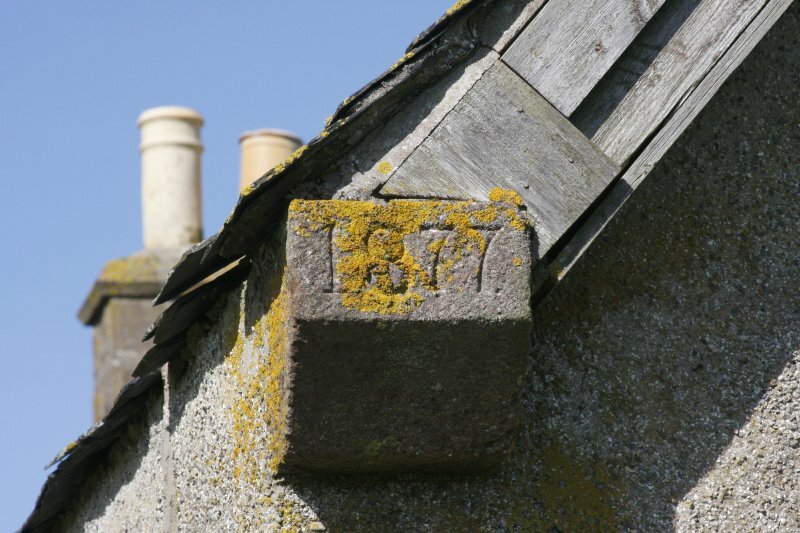 Kearvaig, farmhouse and range, view of W gable from W.
Kearvaig, farmstead, kiln barn, detail of bowl. 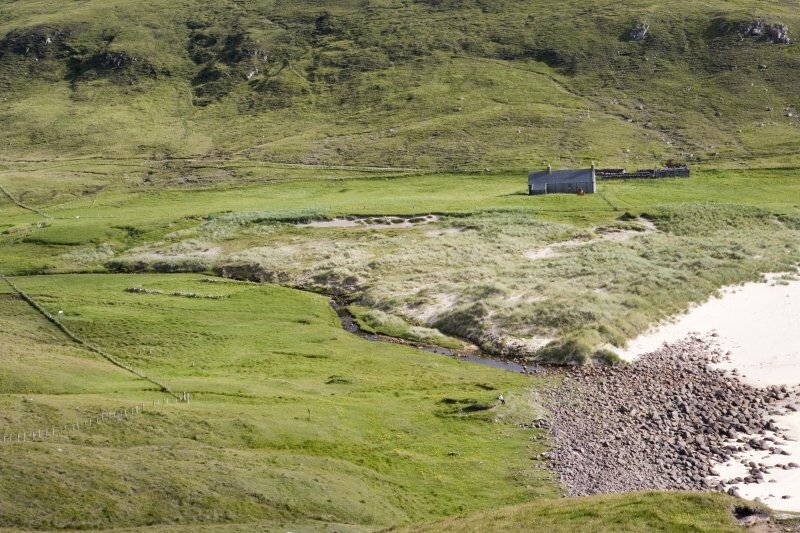 Kearvaig, farmhouse and range, view from NE. 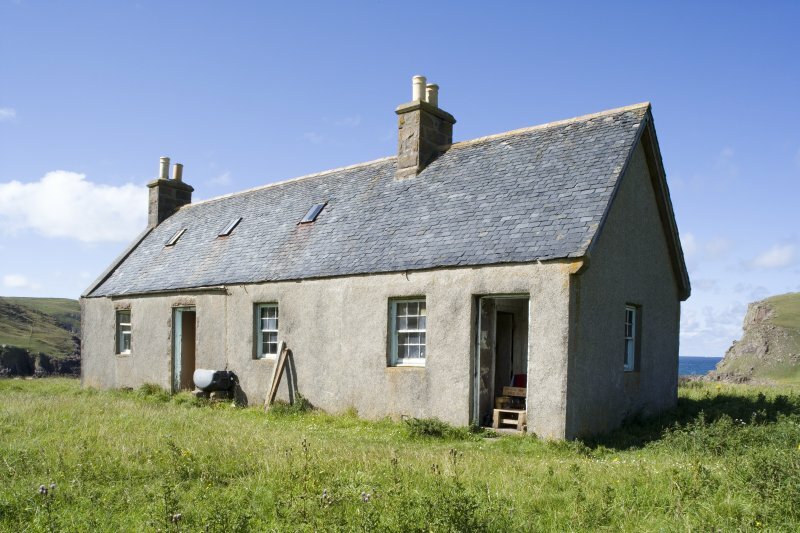 Kearvaig Farmsteading. View from the W of the blocked fireplace in the inner face of the E gable of the range. 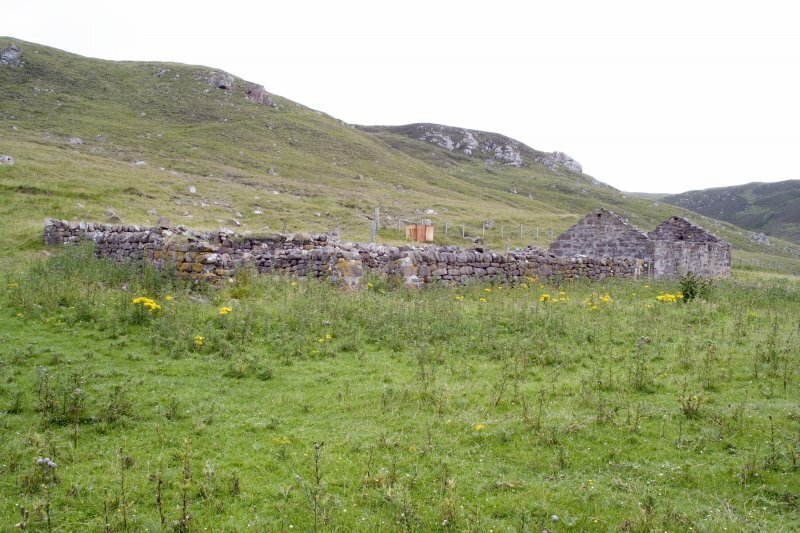 Kearvaig, farmstead, kiln barn, view from SW.
Kearvaig, shepherd's house, view from E.
Kearvaig, farmhouse and range, view from NW. 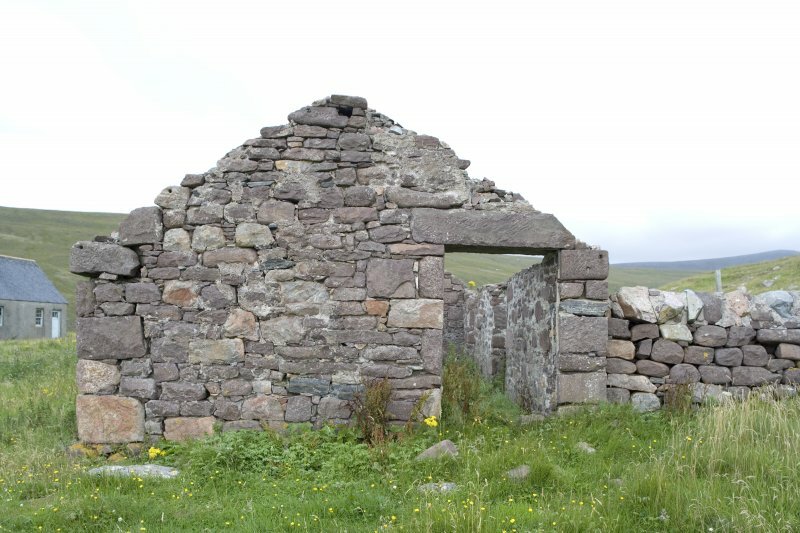 Kearvaig, shepherd's house, view from NE. 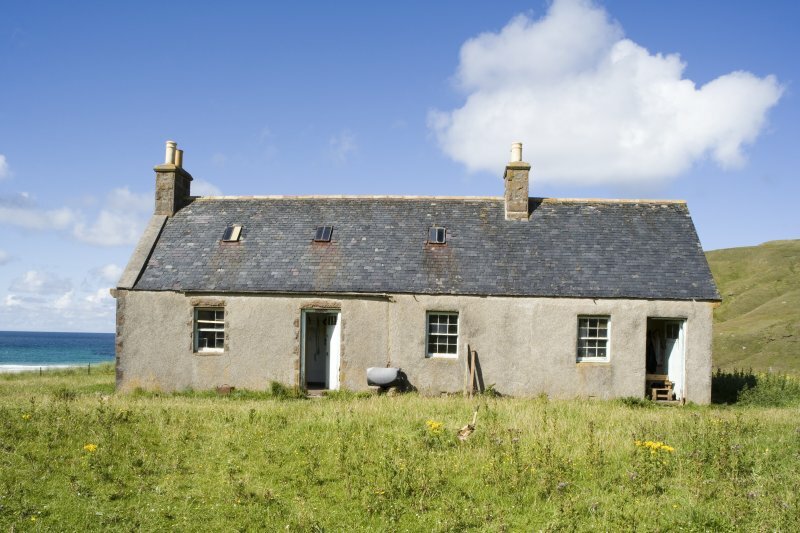 Kearvaig Farmsteading. View from the E of the interior of the W end of the range. 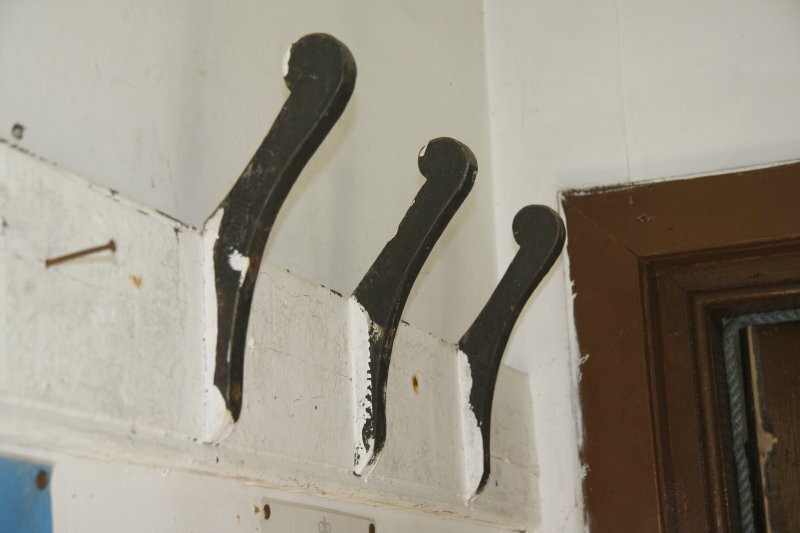 Kearvaig, shepherd's house, detail of wooden coat-pegs in entrance lobby. Kearvaig, farmstead, kiln barn, view from SE. 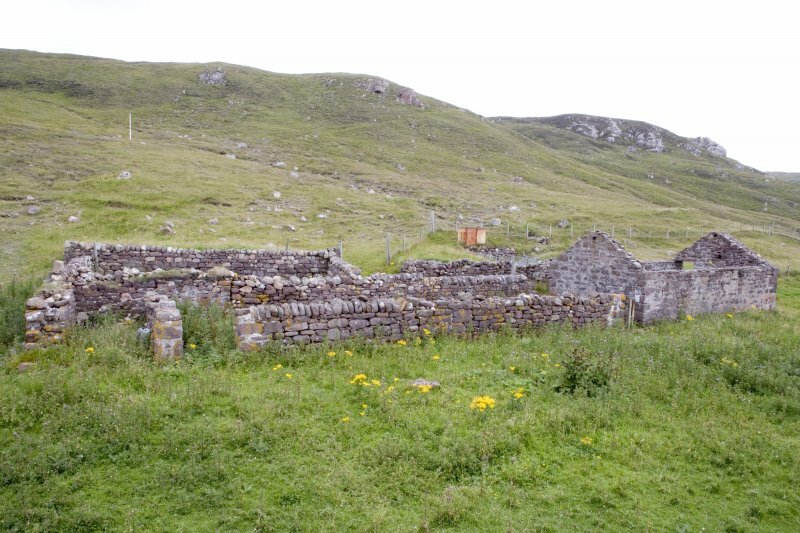 Kearvaig, shepherd's house, view from SW.
Kearvaig, farmstead, general view of range from SE. 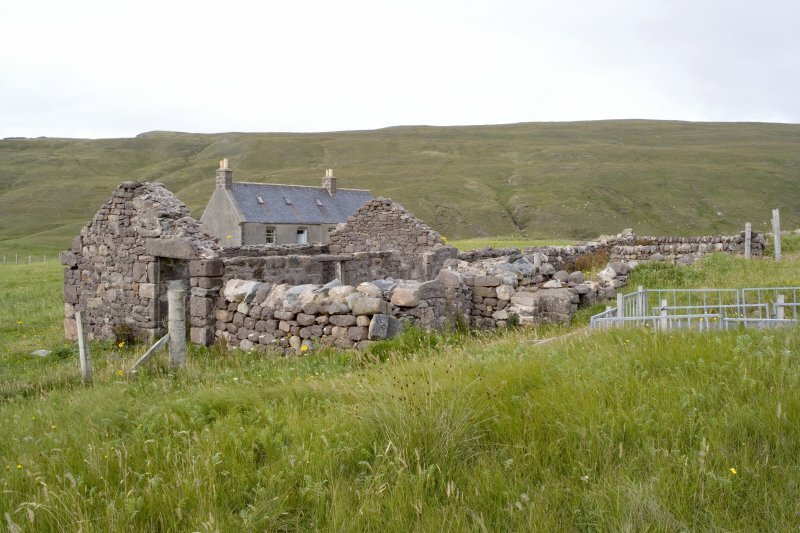 Kearvaig, farmstead and shepherd's house, general view from SE. 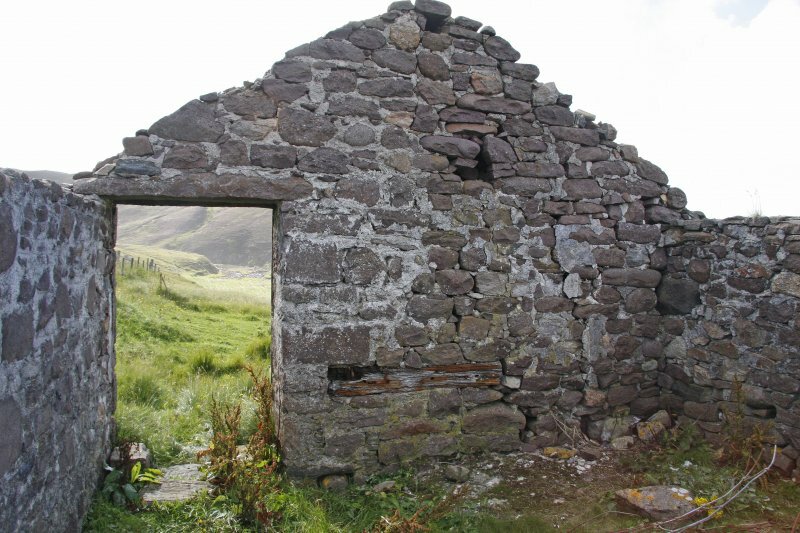 Kearvaig, farmhouse and range, view of E end of interior from W.
Kearvaig, farmhouse and range, detail of doorway in W gable. Oblique aerial view centred on the remains of the buildings, field banks and enclosures, taken from the SSW. Scan of an original pencil drawing of Kearvaig hunting lodge. 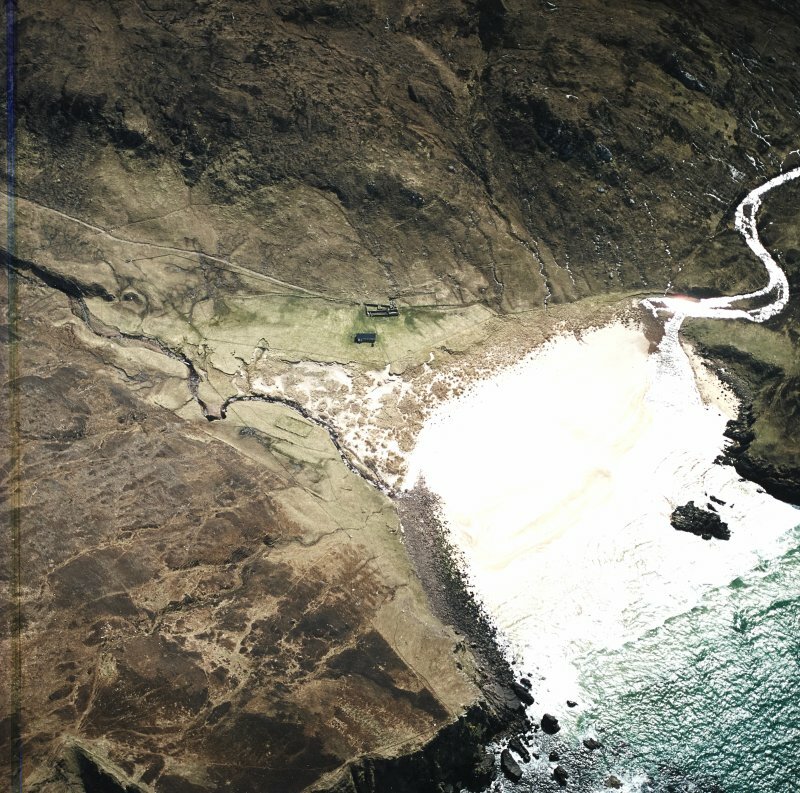 Original drawing was undertaken as part of the RCAHMS Cape Wrath Training Centre survey. 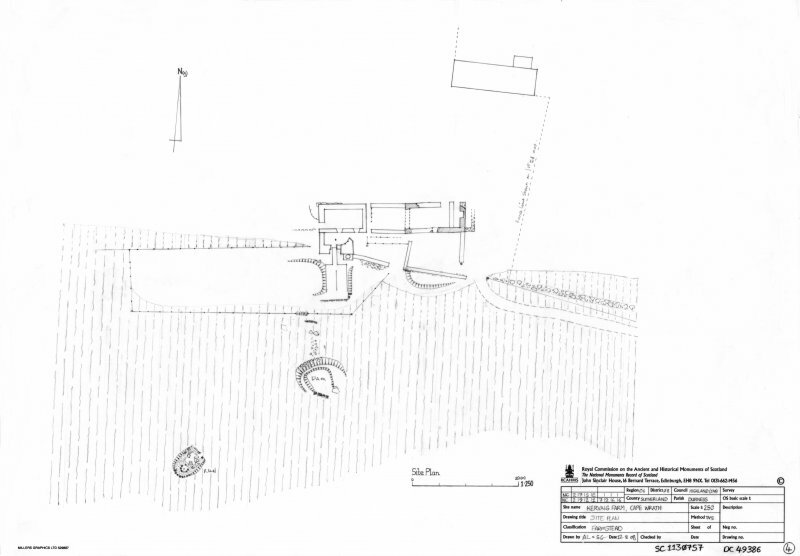 Scan of an original pencil drawing of the site plan of Kearvaig farmstead and hunting lodge. 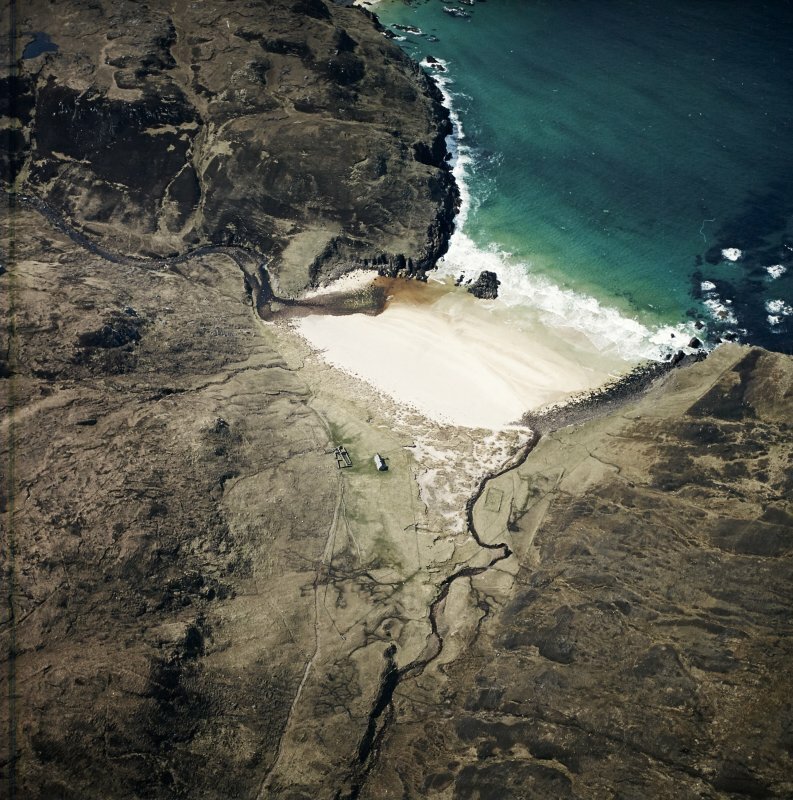 Original drawing was undertaken as part of the RCAHMS Cape Wrath Training Centre survey. 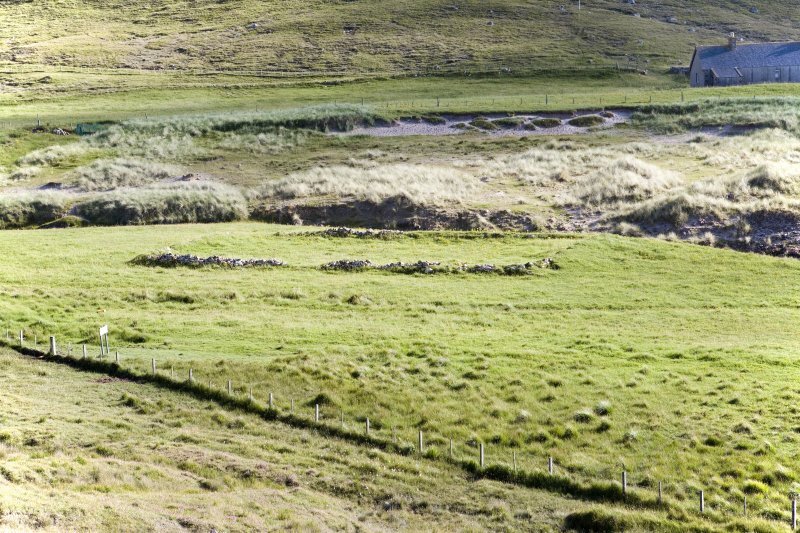 Kearvaig, farmstead, enclosure, view from NNE. 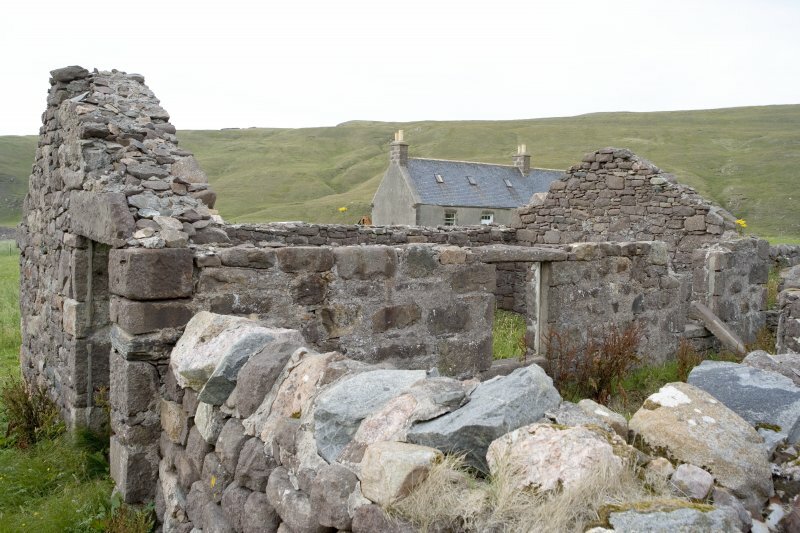 Kearvaig, farmstead, kiln barn, view from SE, with Mr I Parker and Mr A Leith (both RCAHMS). Kearvaig, shepherd's house, skewputts at E end viewed from N.
Kearvaig, shepherd's house, skewputts at E end viewed from NE. 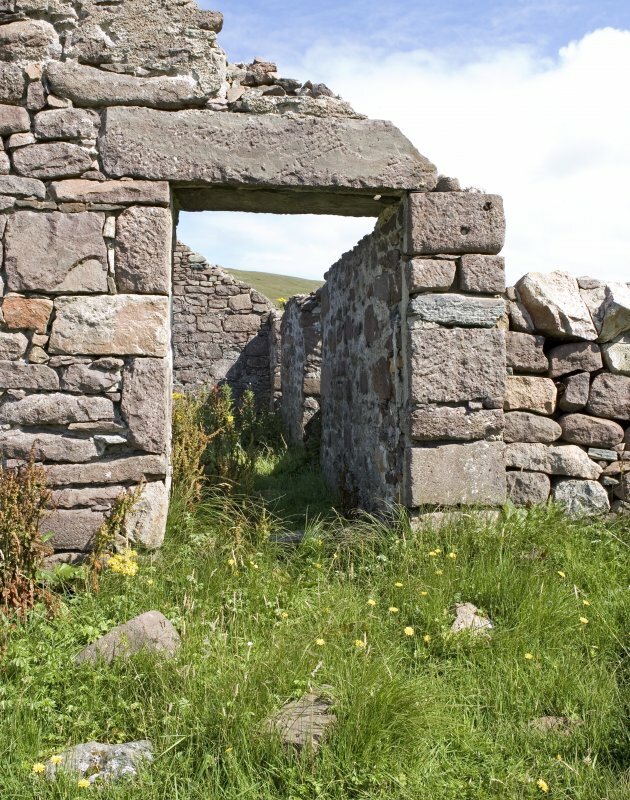 Kearvaig, farmstead, detail of walling to S of farmhouse. 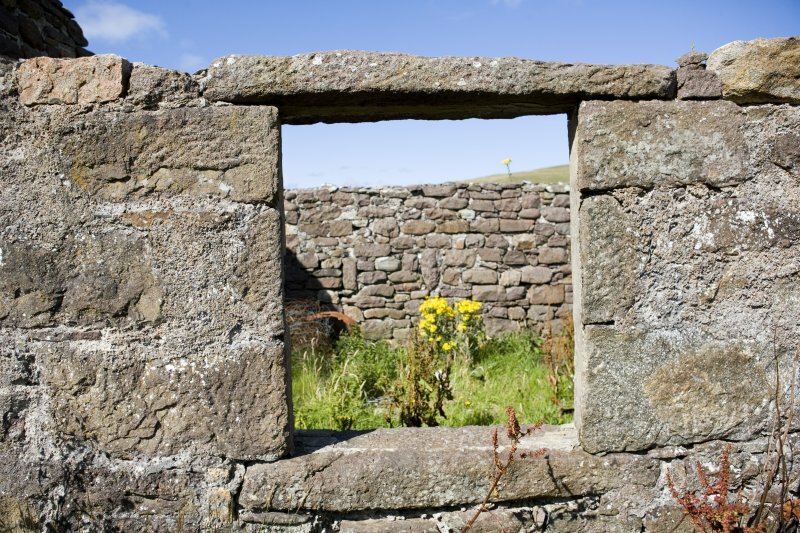 Kearvaig, farmstead, detail of window in west end of range. Kearvaig, farmstead, view of range from NW. 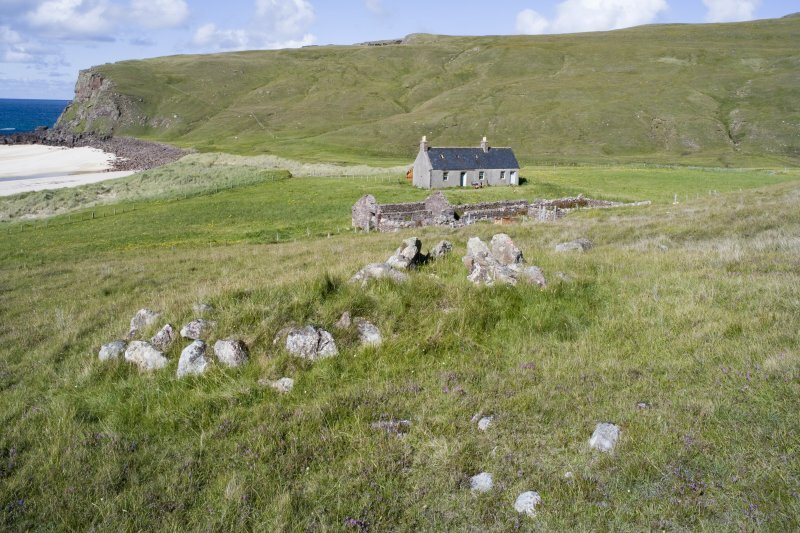 Kearvaig, farmstead and shepherd's house, general view from SSW. 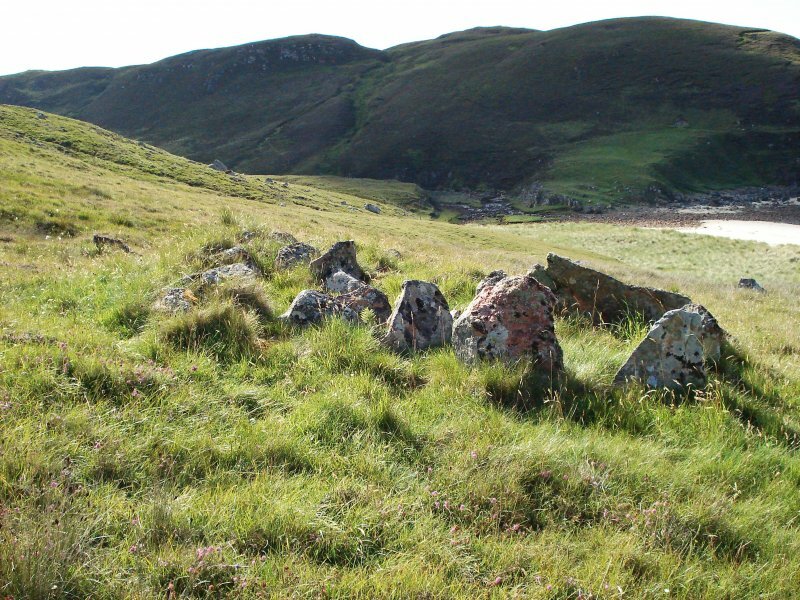 Kearvaig, farmstead and shepherd's house, general view from S.
Stone remains to the foundations of a house and garden measuring about 15m by 10m. 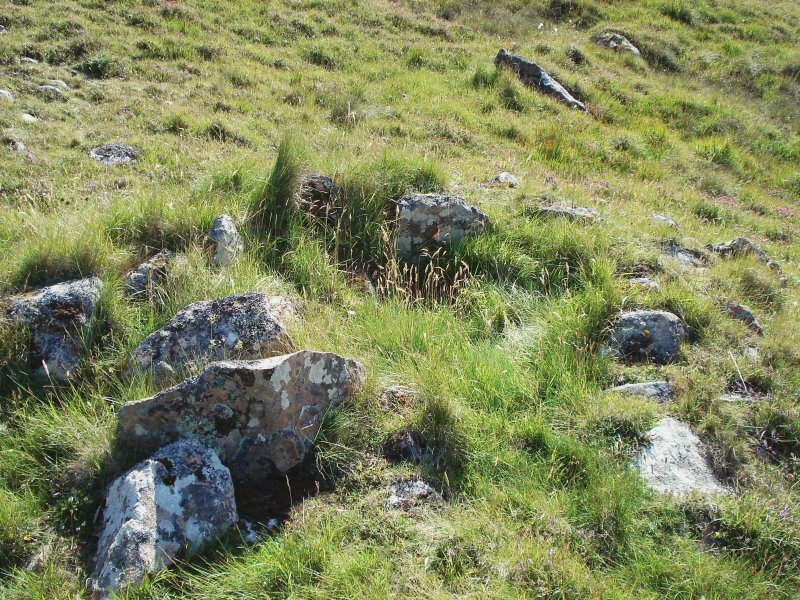 The rectangular shape is formed by raising a bank on top of which are the remains of four external walls of the house, together measuring about 1m high. On average, the width of the wall measures about 1m. The building has been divided into a number of rooms, the internal walls clearly represented by the survival of a number of irregular but linearly aligned stones within the four external walls of the building. The entrance of the building is located on the south-eastern corner and measures about 3m wide. The garden is likely to have been present in the northern corner due to the presence of rhubarb plants. 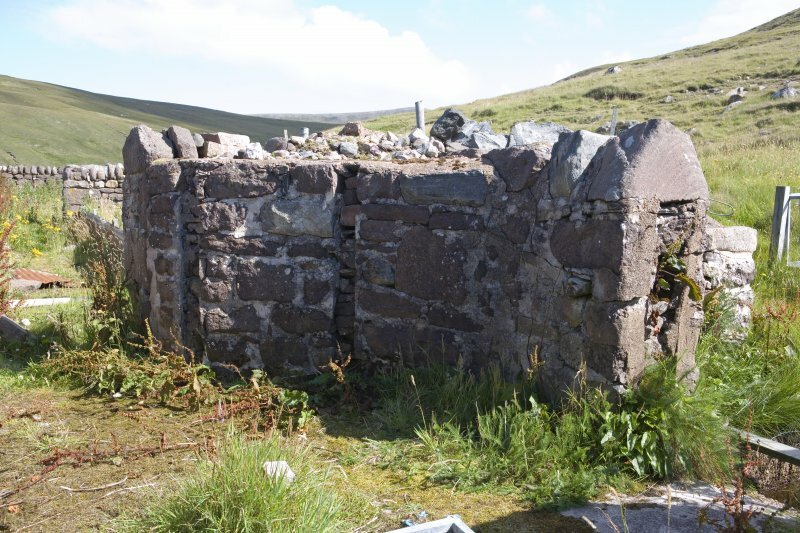 It was likely that the building was enclosed within a property boundary, as evidenced by the remains of an extensive wall which can be seen on the north eastern slope side of the building. Due to a lack of time, the length of the wall and where it ended was not investigated further. 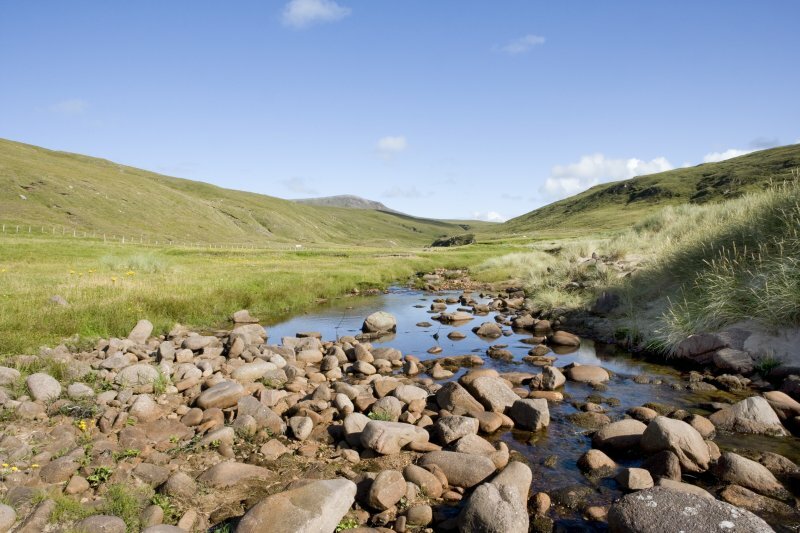 It is likely that the site dates from the 19th century as a remnant of the Highland clearances. NC 29283 72776. This site was located during the 2000 survey. 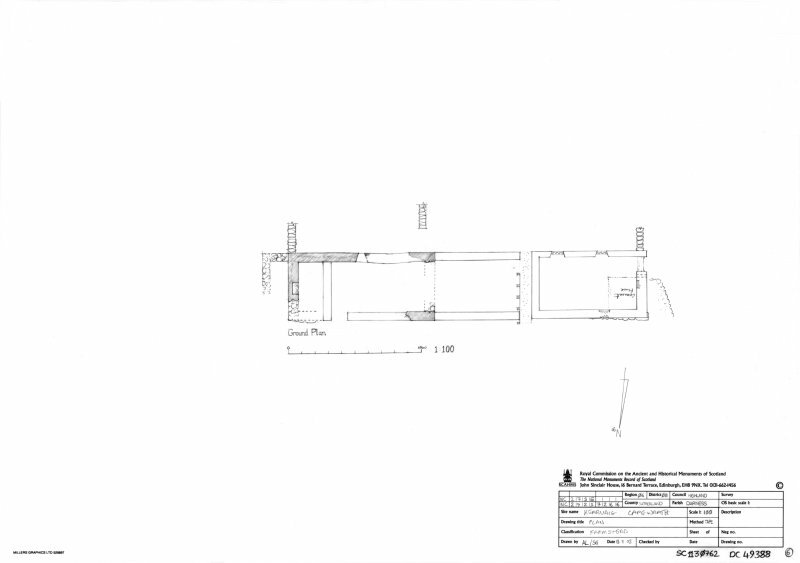 The original SMR entry refers to the footings of a house and walled garden. 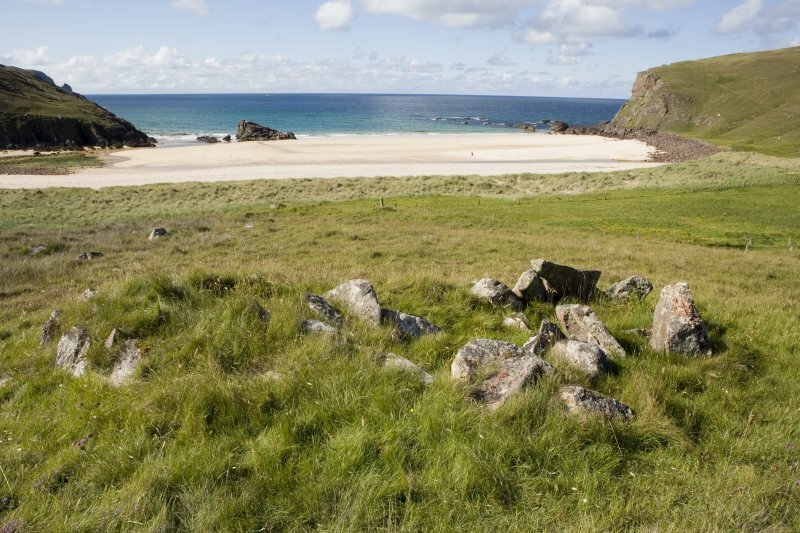 The site was revisited this year and reassessed. The structure remains as per the original description. However the structure is not that of a house and a garden but of a walled stock enclosure. 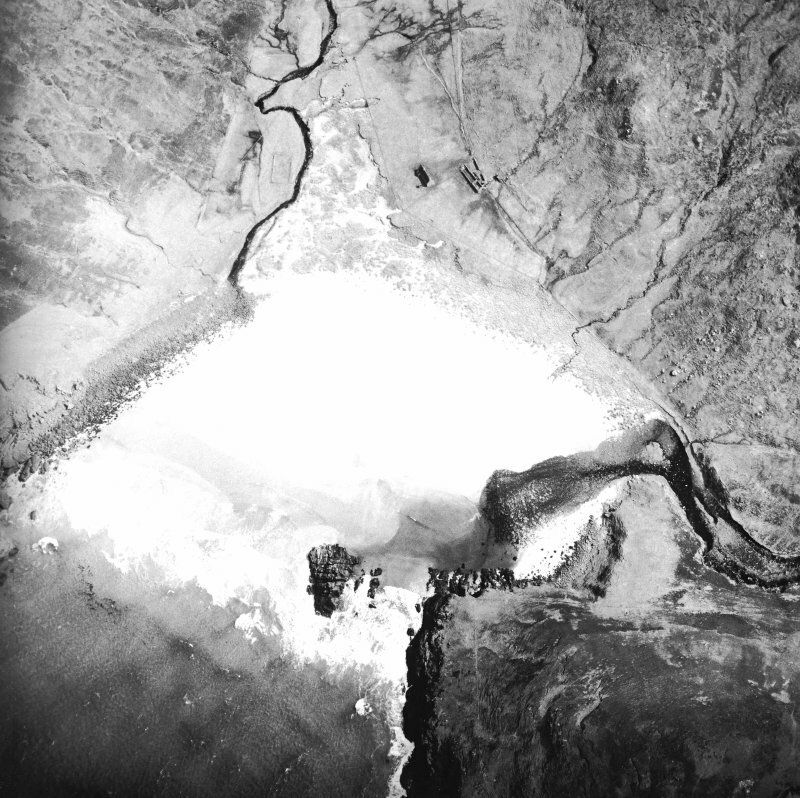 There is no evidence to suggest the presence of compartments, from what was observed the enclosure is rectangular in shape and measures approximately 30 metres by 15. The entrance to the enclosure is from the NW facing side. The rhubarb described in the corner of the enclosure is more likely to be wild rather than cultivated. To the west of the enclosure is a 19th century Black house which is almost certainly associated with this structure. Immediately to the west of the structure lies the footing's of a bridge which crossed the burn and linked the two sites. Recorded in plan. 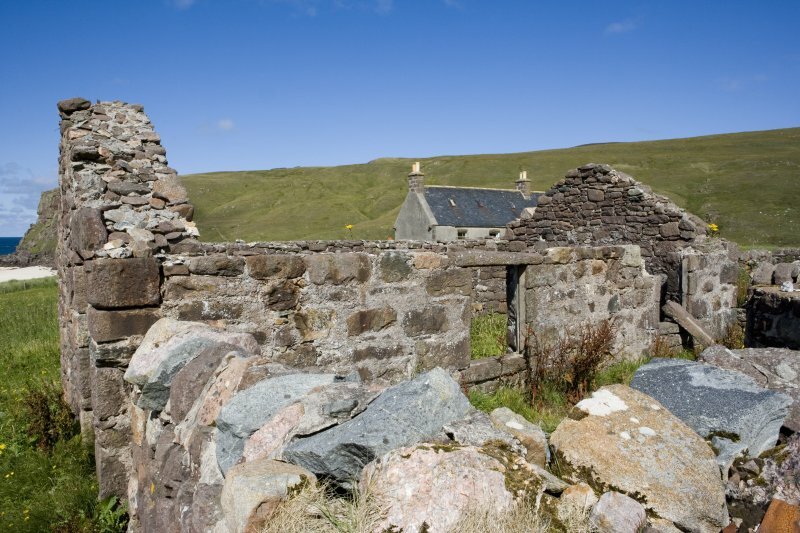 Kearvaig Bothy. 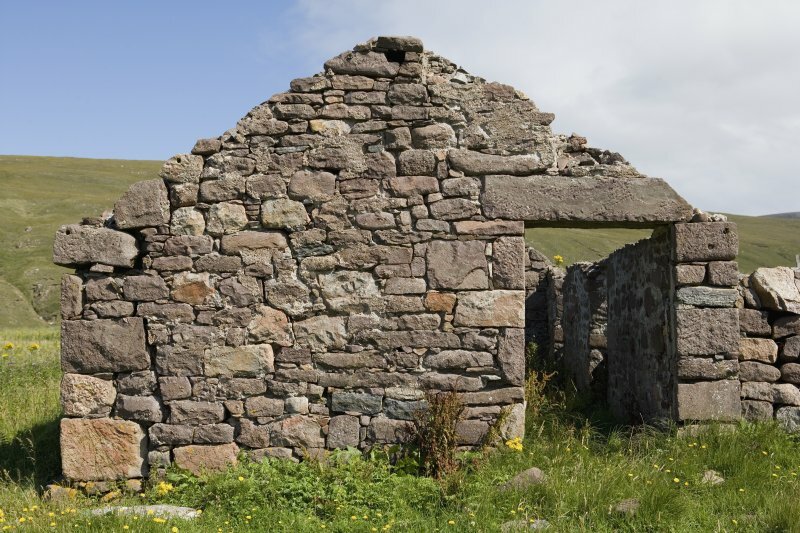 This structure belongs to and is maintained by the Scottish Bothy Association. 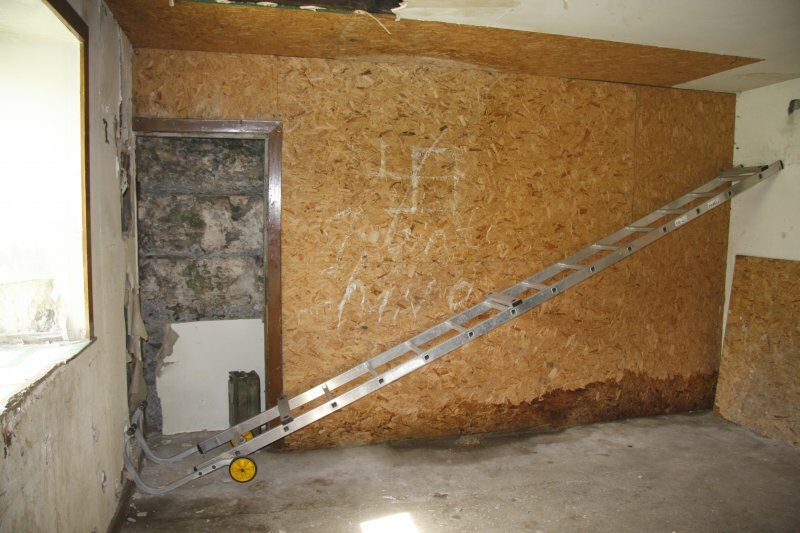 The building is in a good condition. 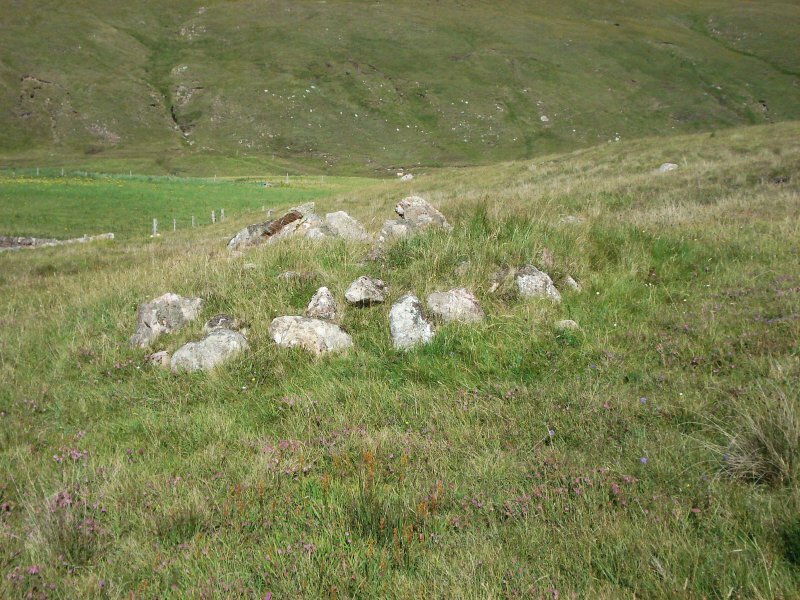 The presence of the ruined blackhouse near to the bothy suggests that the site has been occupied for approximately 200 years. 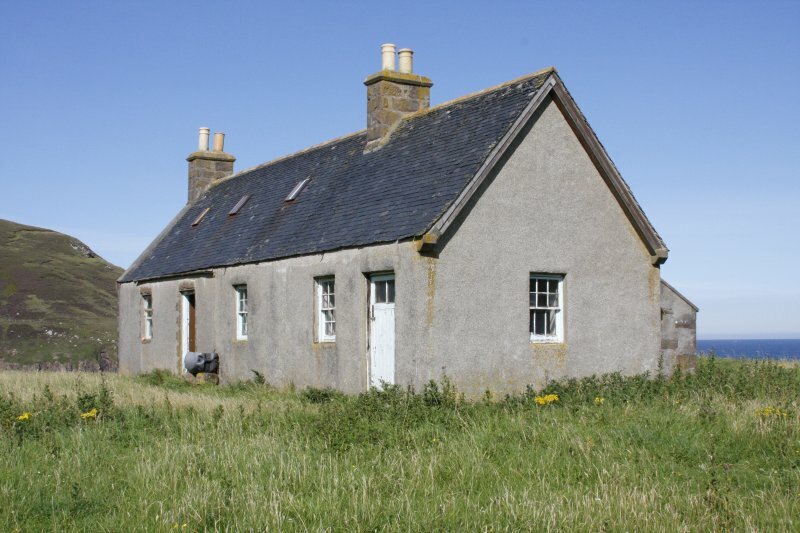 The black house appears to have been abandoned in recent times, certainly no more than 40 years and despite the lack of a roof is in good condition. 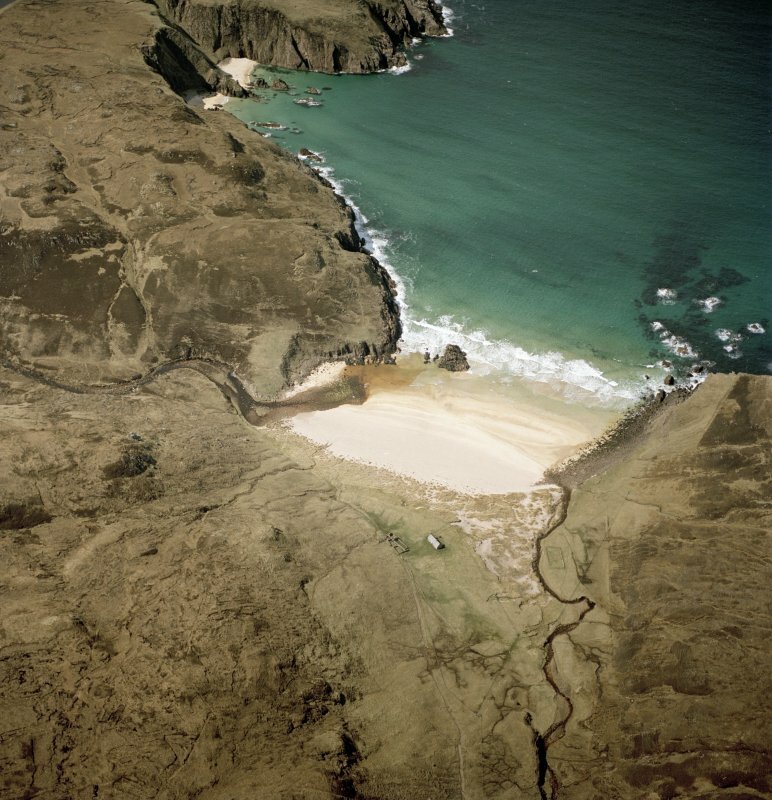 Two buildings, one of which is roofed, and at least five enclosures have been recorded on oblique aerial photography (RCAHMSAP 2004) lying among fragmentary field banks to the SE of Kearvaig Bay. At least three enclosures adjoin the unroofed building and an additional rectilinear enclosure lies immediately adjacent. 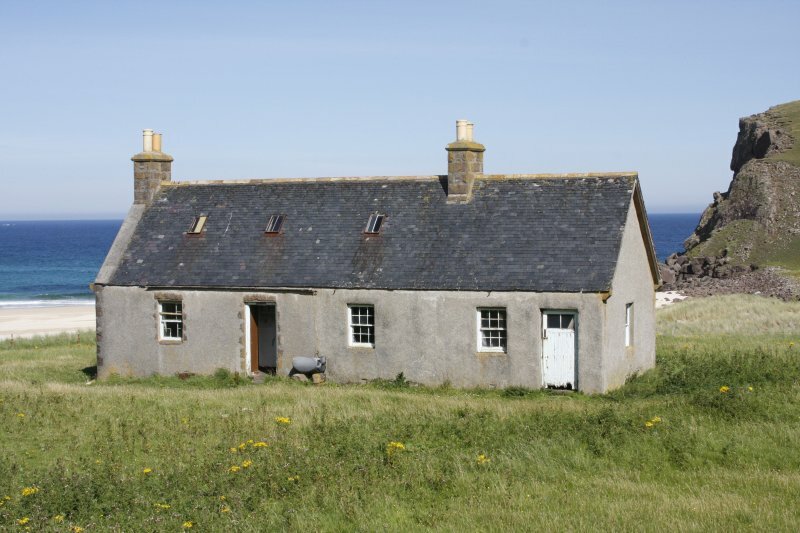 The roofed building, which is used as a bothy, lies about 30m to the NE and an additional rectilinear enclosure can be seen to the NE. One roofed building and two rectilinear enclosures are depicted on the 1st edition of the OS 6-inch map (Sutherland 1878, Sheet I). 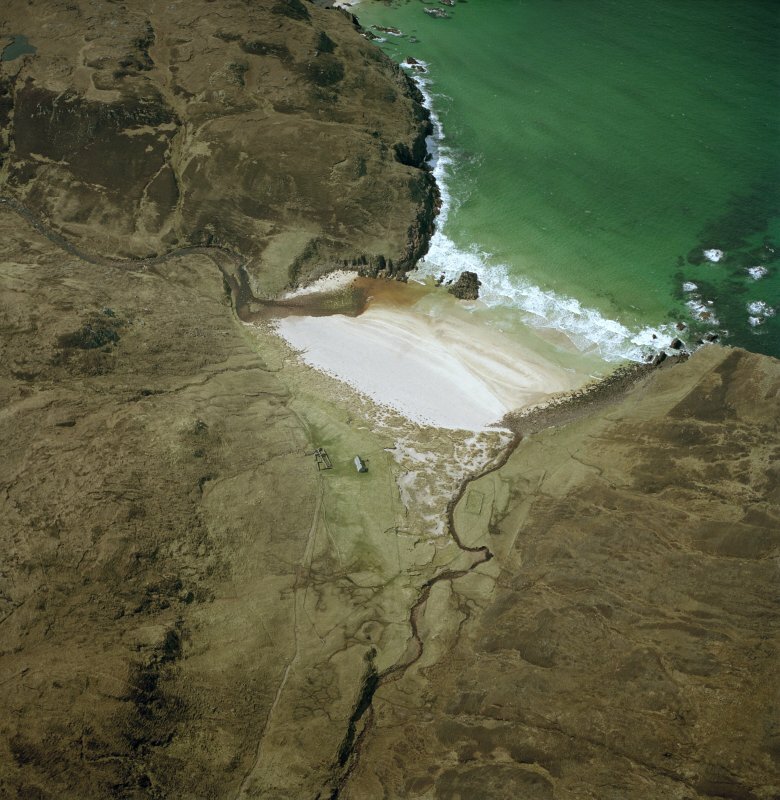 Information from RCAHMS (KMM) 21 April 2005. 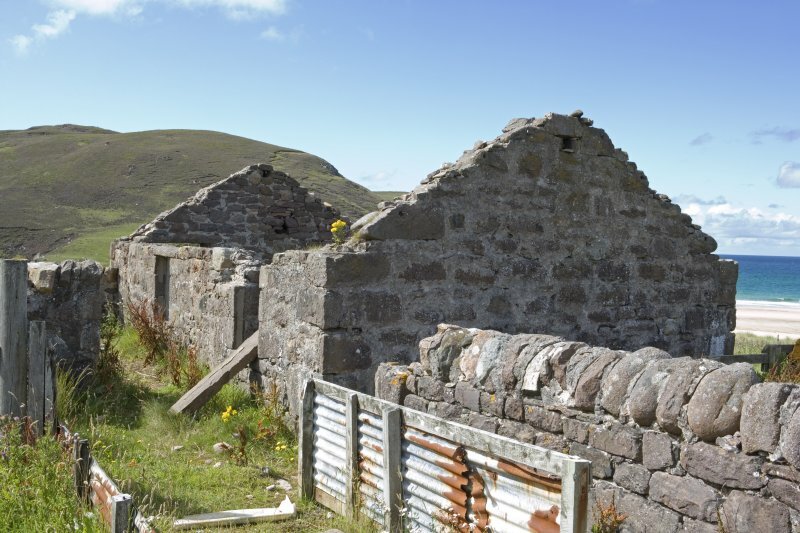 This abandoned farmstead, which is situated at the foot of a steep N-facing slope on the S side of Kearvaig Bay, comprises a range (containing at least one dwelling), a kiln barn, a dam that supplied water to a sheep dip adjacent to the range, and a hunting lodge built in 1877 but later used (until about 1950) as a shepherd’s house. 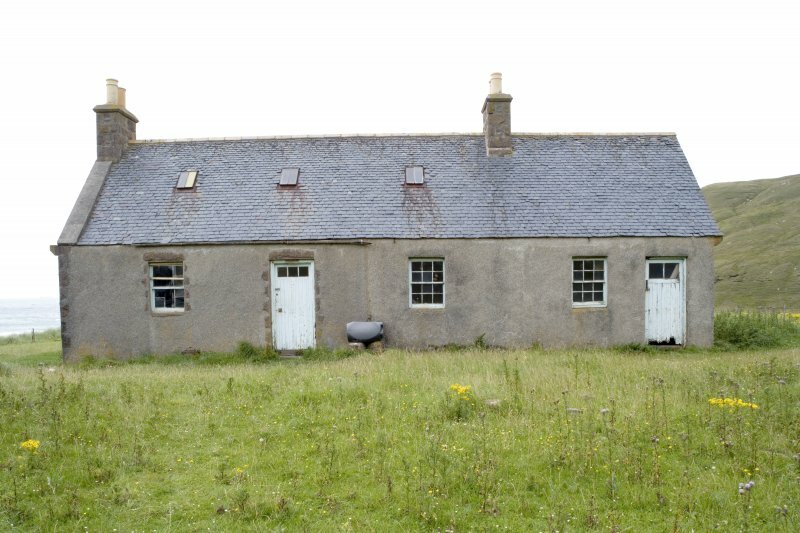 The steading stands on the edge of an area of flattish sandy ground that has formerly been cultivated. 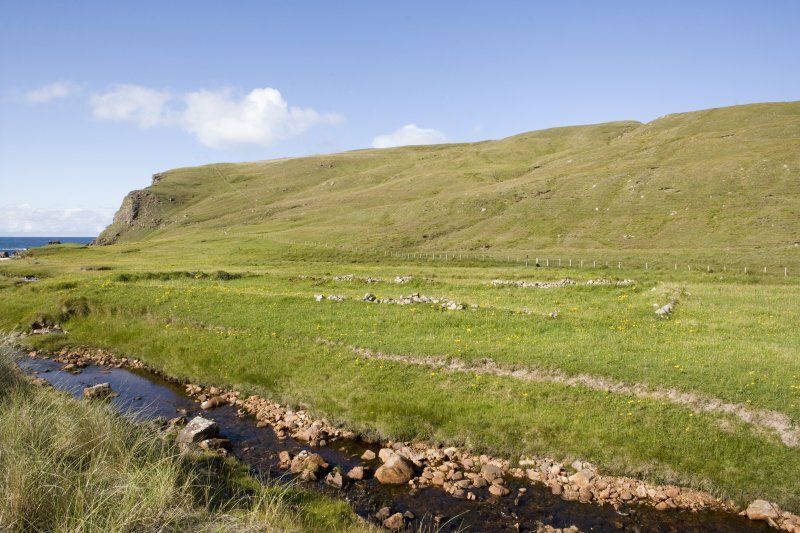 In the vicinity of the steading there is an enclosure (CWTC08 399) and a number of ruined stone walls and earthen banks (CWTC08 423–31), which are probably largely associated with the keeping of livestock, particularly sheep, from the late 18th century. 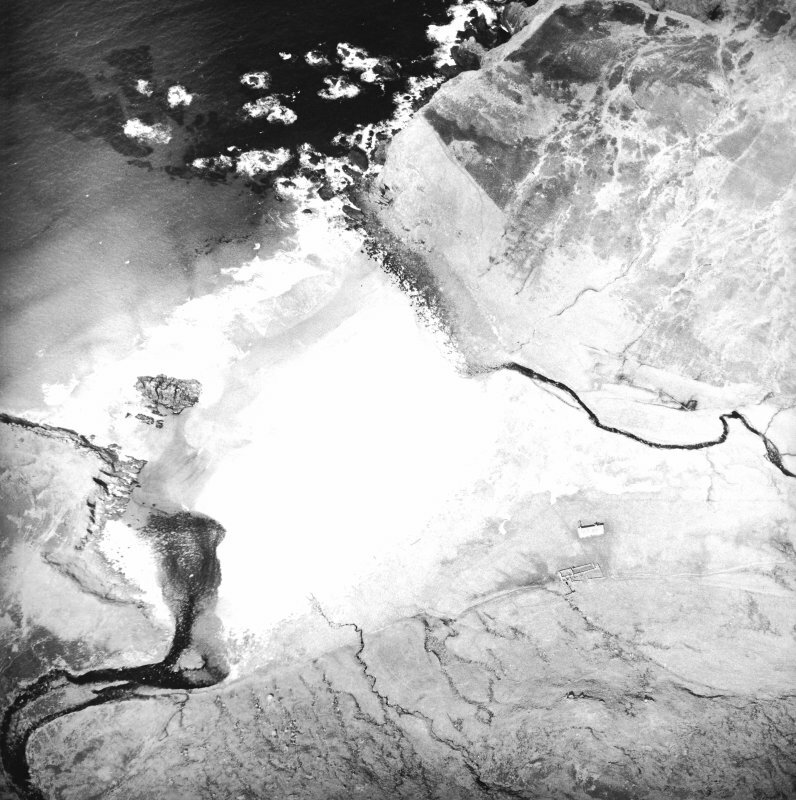 On the E side of the bay there is a small area of lazy-bed cultivation (CWTC08 433–34). Kerwick is depicted on Bryce’s map of about 1744. 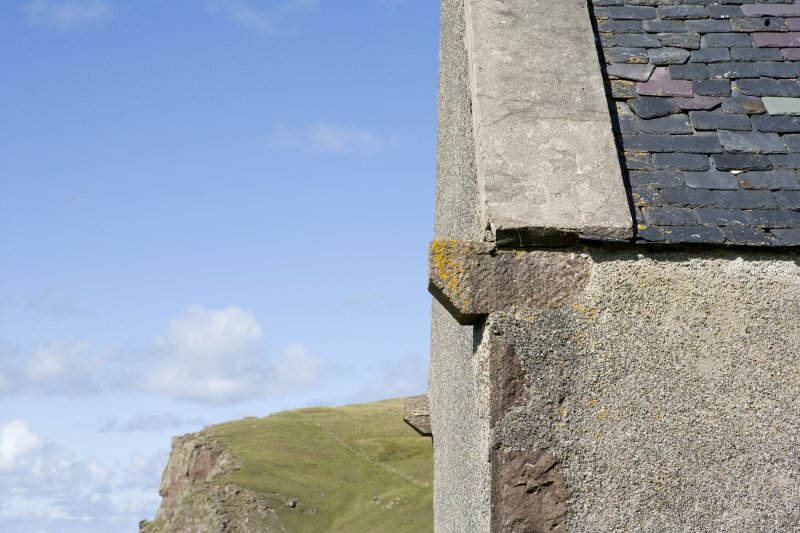 In 1834, the Reverend William Findlater noted that by then, with the exception of those at the lighthouse, the only families then inhabiting The Parph were those of shepherds (1845, 82-104). 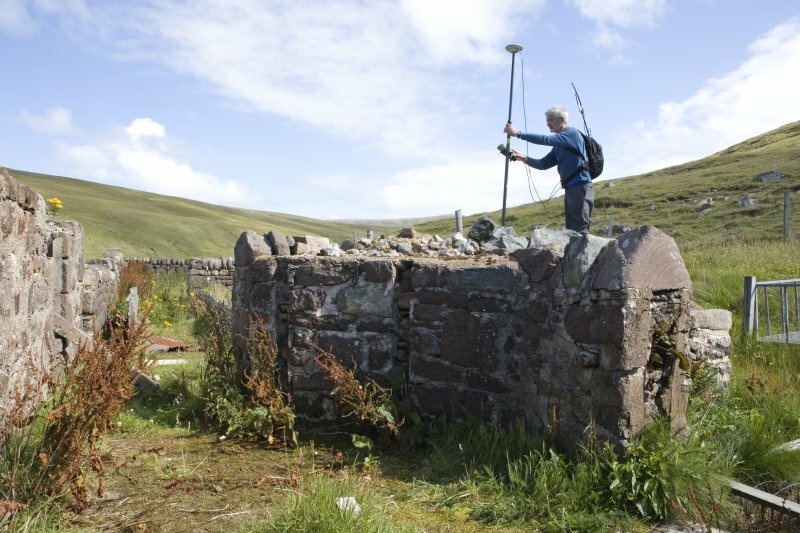 The range (CWTC08 273) measures 27m from ENE to WSW by 5m transversely and it contains the remains of three buildings. 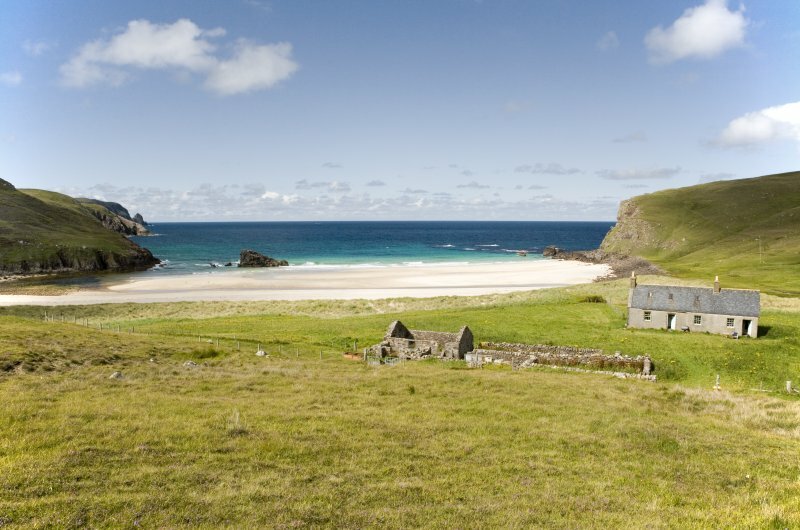 That at the ENE end is a dwelling, the walls of which have been reduced in height and given a cope for use as part of a complex of stock enclosures. 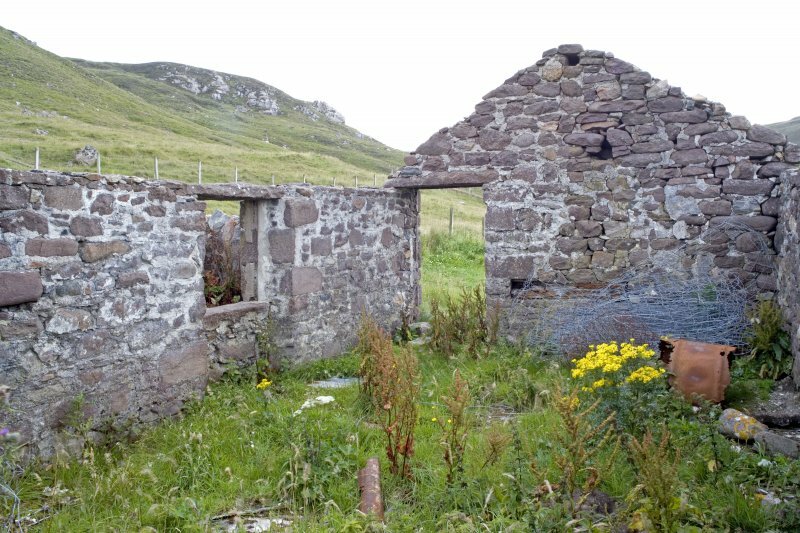 Although this building has been considerably altered, a fireplace is visible in its ENE end and there are the fragmentary remains of other openings which indicate that the dwelling was similar to the earlier of the two dwellings at Inshore (NC36NW 2), which also belonged to Sutherland Estates. That is to say it had a central doorway and flanking windows on the NNE that lit the two principal rooms (a kitchen and a parlour) and that there was probably a smaller room between them to the rear of the lobby. It is probably this building that is described by the Ordnance Survey about 1874 as ‘thatched and in neat repair’ (Name Book No. 16, p.8). 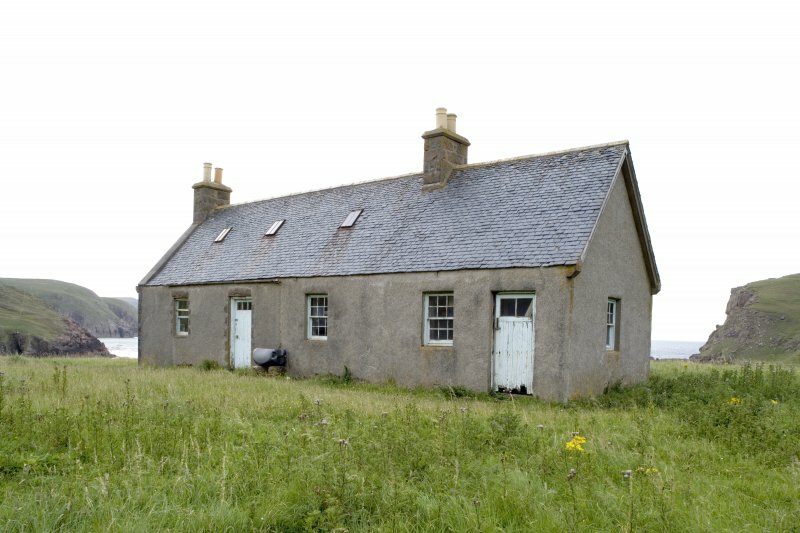 The overall dimensions of the dwelling at Kearvaig (11.2m by 5.2m) compare favourably with those of the Inshore cottage (10.8m by 5.2m). At the WSW end of the range is a building (Fig.24) measuring 8.5m in length by 5.1m transversely, which survives to its wall-heads and gables, but the purpose of which is not known. 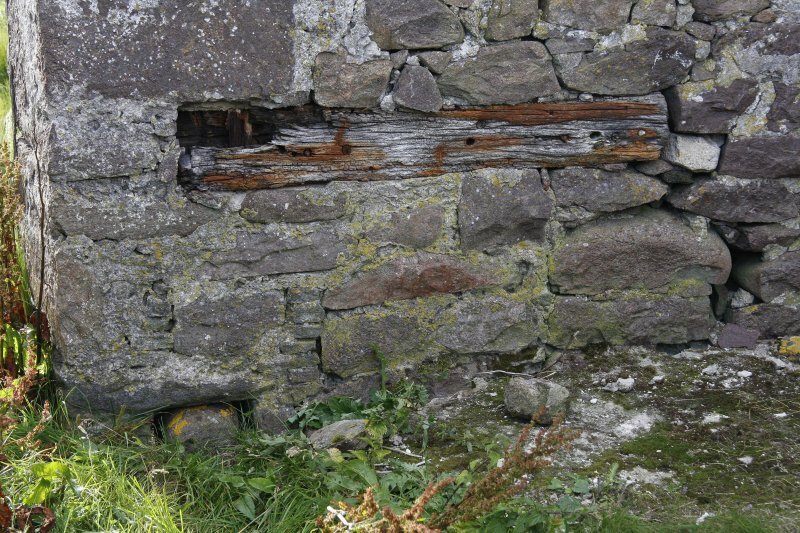 It exhibits few features that appear to belong to its original phase of construction, though there is a blocked window in the front (NNW) wall and at floor level in the WSW end-wall there is a blocked drain and an infilled opening that has a timber lintel. 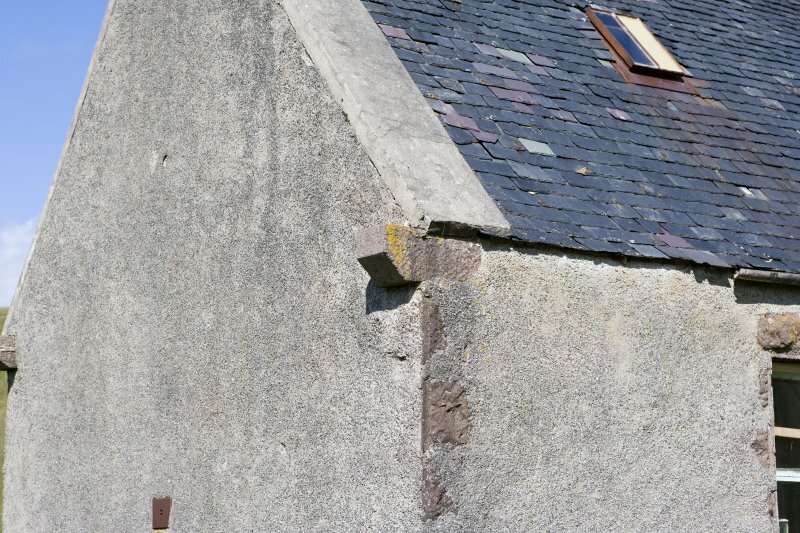 Neither gable contains a fireplace, and the doorway in the WSW end is a later insertion. The rear wall, which contains two windows, is much narrower that the front wall and is therefore probably a secondary feature. The blocked drain in the WSW end-wall probably originally led out to a midden-pit, which is situated immediately W of the range. 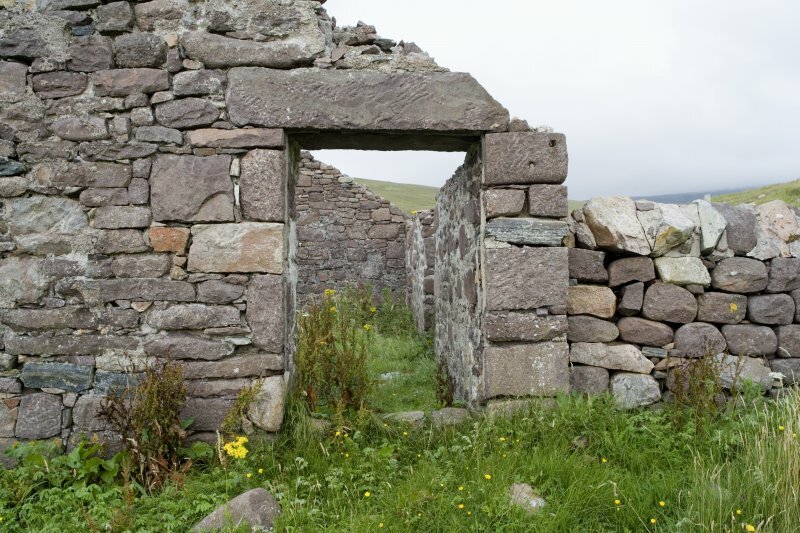 The two buildings just described stand some 12m apart and in the gap between them are the footings of a building that now support the drystone walls of a stock enclosure, the WSW end of which comprises a simple fence and the ENE end of which extends into the cottage. Immediately S of the W end of the range is a fragmentary outshot, with an under-fired boiler set against its S side. 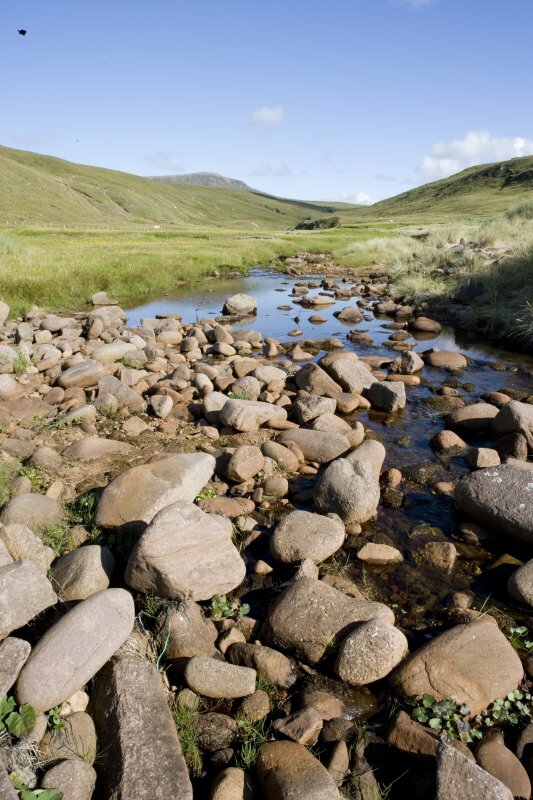 This boiler is associated with the adjacent sheep-dip, which was supplied with water from a small dammed pond (CWTC08 274) some 20m to the S. The sheep were led into the dip via a series of stone-walled enclosures built on to the S side of the range. 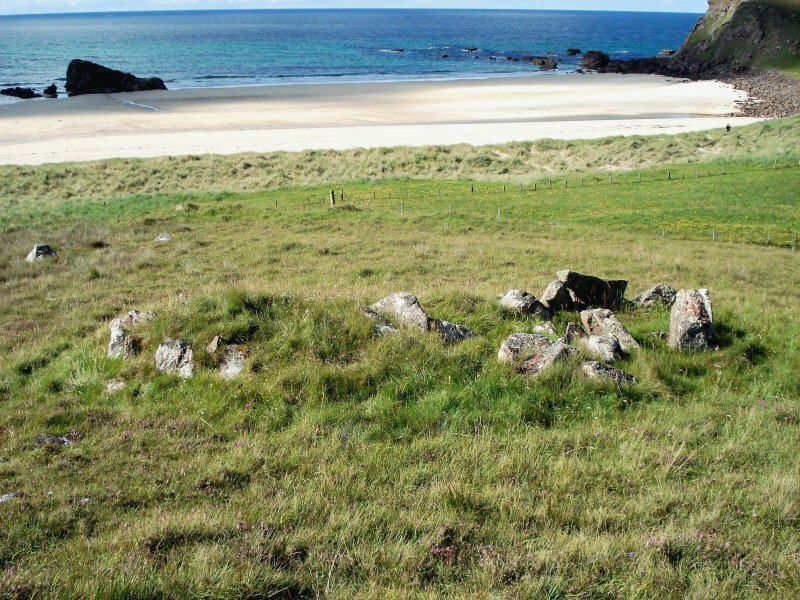 Situated 45m SW of the range there are the grass-grown remains of a kiln barn (CWTC08 128) originally identified as an oval hut (Welsh 1972). Subrectangular on plan with a rounded SW end, it measures 6m in length by about 3.7m in breadth over a wall reduced to boulder footings. The SW end contains a small kiln-pot measuring no more than 1m in diameter, and there is probably an entrance in the NE end. 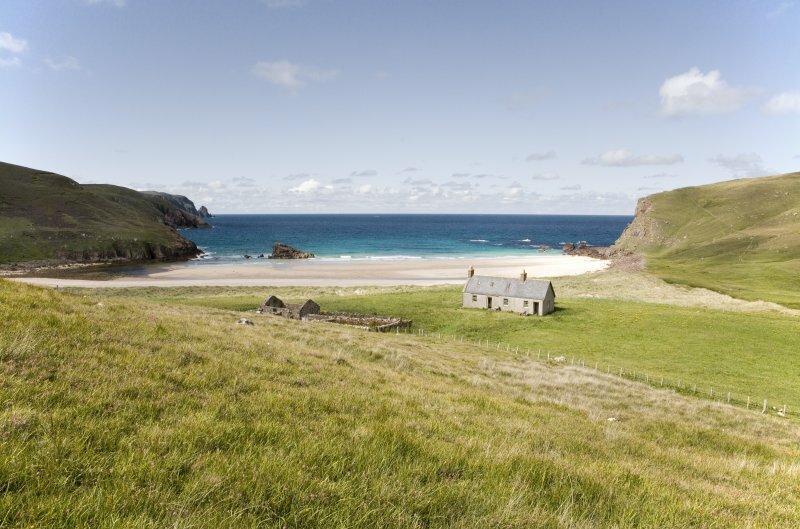 The hunting lodge (CWTC08 127) stands 20m NNE of the range and is now used as accommodation by the military during exercises and as a bothy by the general public at other times. The style of the building, especially the extended skews (one bears the date 1877) and the overhanging eaves, conforms exactly to the style of Sutherland Estates, and it can therefore be assumed that it was constructed by them. 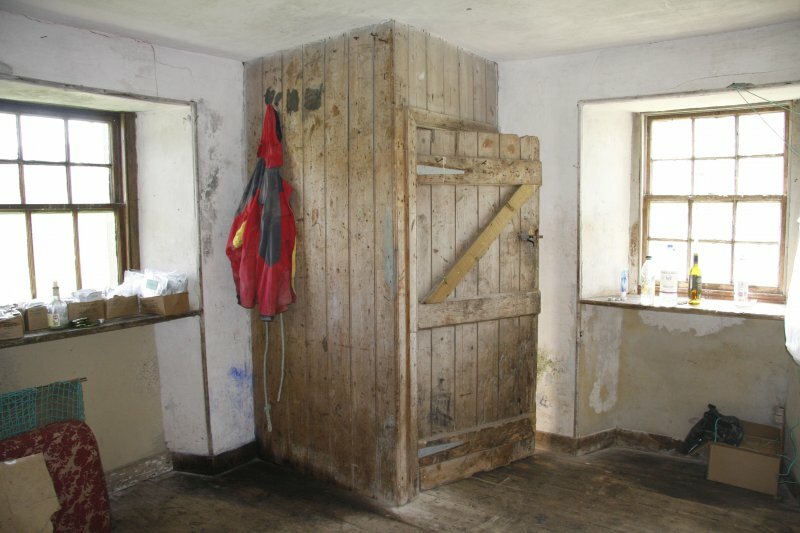 The layout and internal fittings strongly suggest that it was built as accommodation for parties of shooters and fishermen. 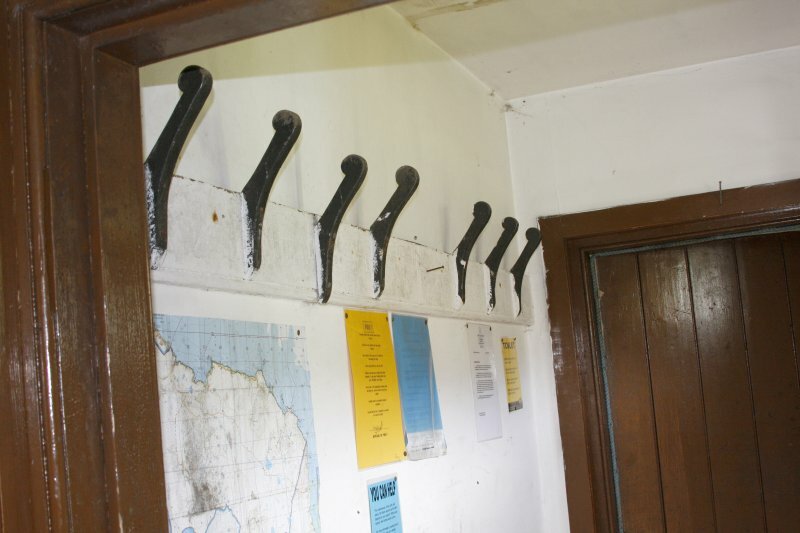 The lodge comprises a cottage with an additional one-room apartment attached to its E end, both with a single entrance on the S. The entrance to the cottage leads into a small lobby containing a rack of wooden coat pegs. The room to the left, which was once a kitchen, has a sash-and-case window in its S side, but the fireplace in the centre of the W gable is hidden by a modern fibreboard cladding, which obscures everything except a door-less and shelf-less press at the S end. A steep staircase leads off the centre of the E side of the kitchen to a two-room attic lit by skylights in the slate roof. The kitchen also provides access to a small room behind the stair, which is lit by a window in the N wall. 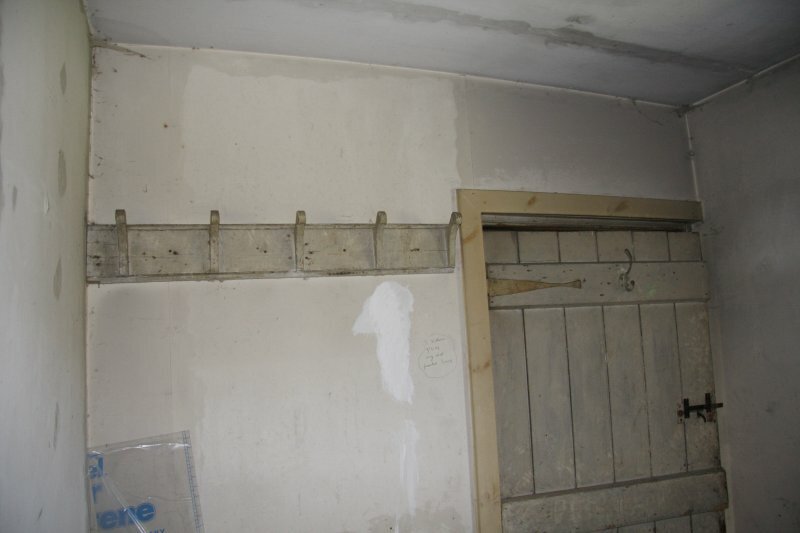 A rack of five wooden coat pegs on the wall beside the door is very similar to the rack of pegs in the lobby. 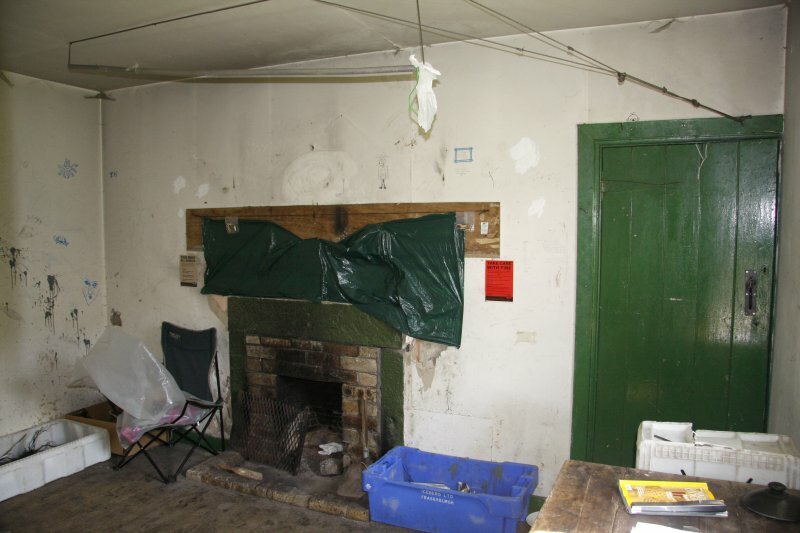 The room to the right of the lobby, which was originally a parlour, also has a sash-and-case window in its S side and in the E end-wall there is a two-period fireplace, the earlier granite, the later a brick insert, and there is a press with a wooden door at the S end. The quality and standard of the finishings in the one-room apartment is higher than in the adjoining cottage. 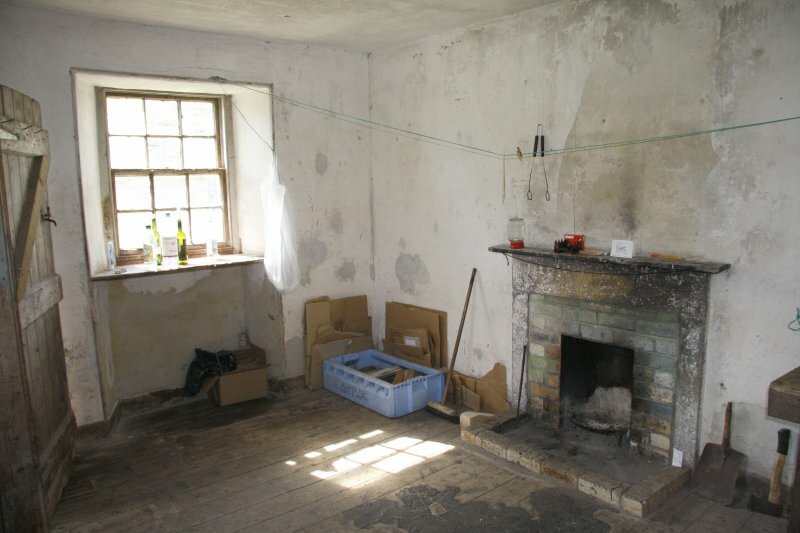 This room, which is entered through a small strip-timber-clad lobby, has a sash-and-case window in both its S side and E end, and there is a two-period fireplace, identical to that in the cottage, in the mid-gable it shares with the cottage. A stone-walled and slate-roofed outshot, with a window in its W end and an entrance in its E end, has been built against the N wall of the apartment. Visited by RCAHMS (SG) 12 August 2008. 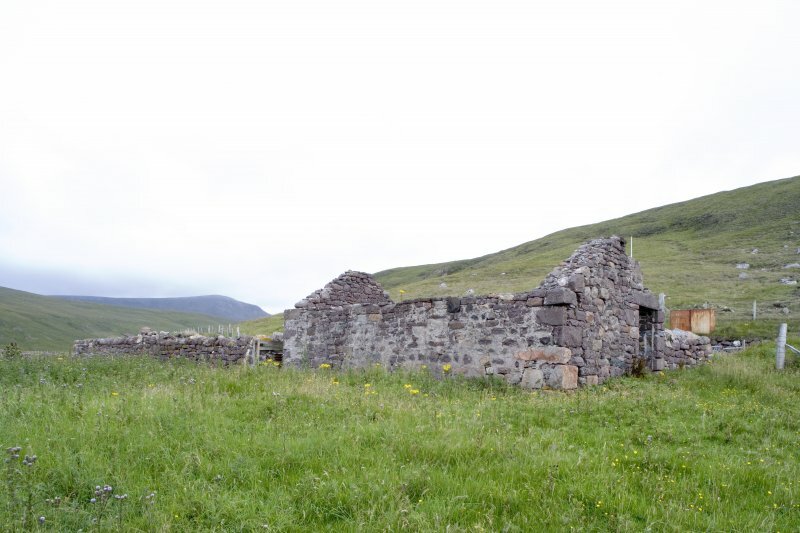 Research into the Sutherland Papers by Malcolm Bangor-Jones has revealed that the hunting lodge (CWTC08 127) noted in the previous account was purpose-built as a shepherd's house as part of the lease agreement between Sutherland Estate and William Scott, who took over the lease of Balnakeil (an extensive sheep farm of which Kearvaig formed part) in 1874. 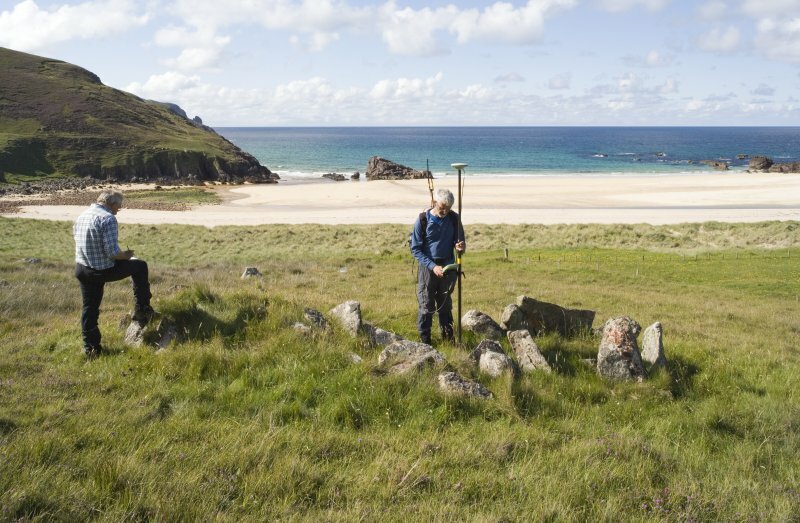 Information from RCAHMS (JRS), 24 February 2010. 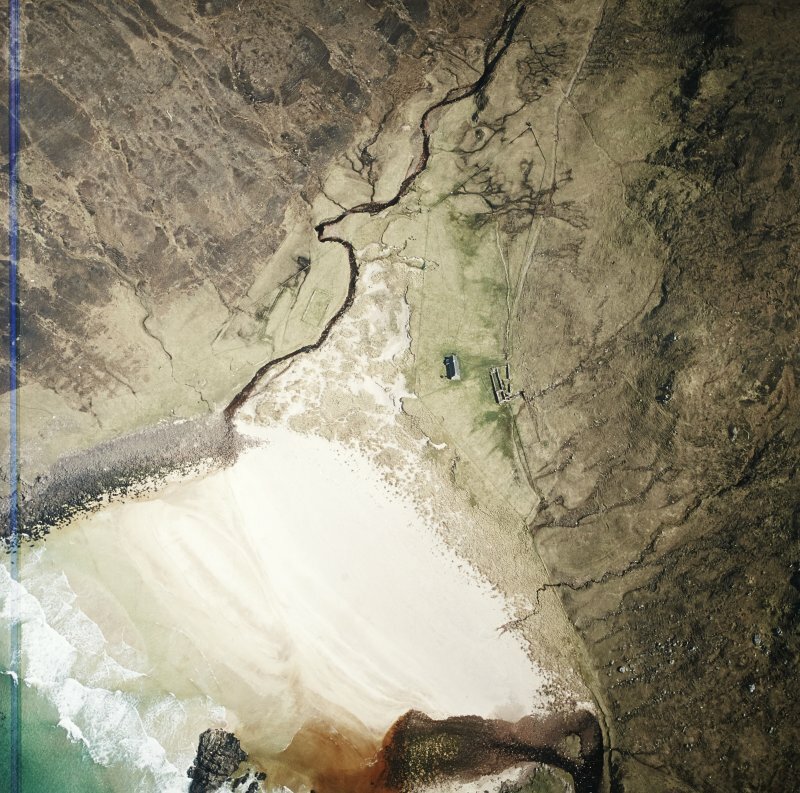 Site recorded as a result of the RCAHMS aerial survey programme. 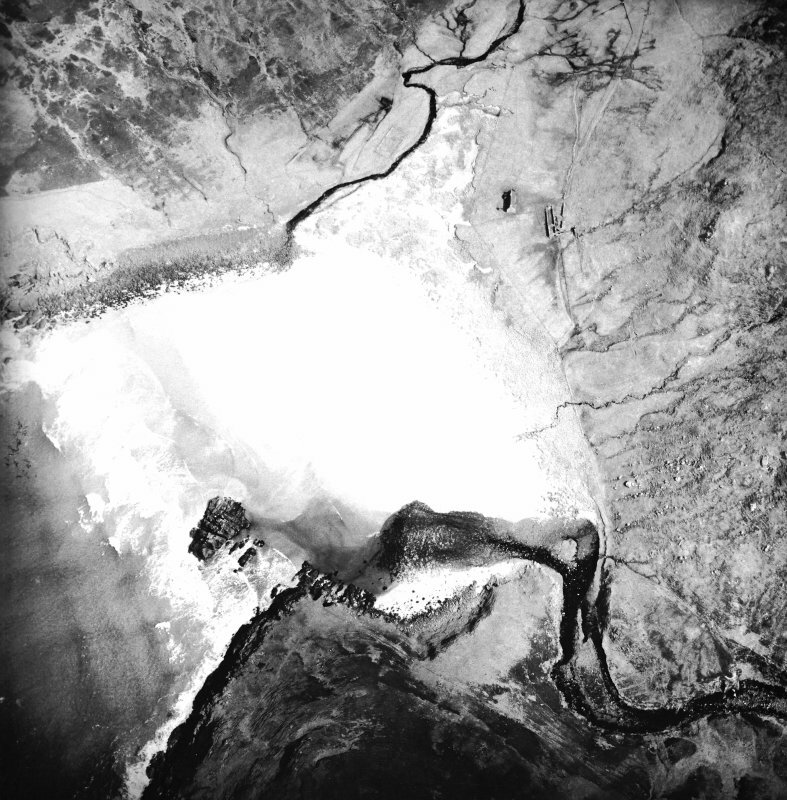 Description of site written as a result of an examination of aerial photographs.